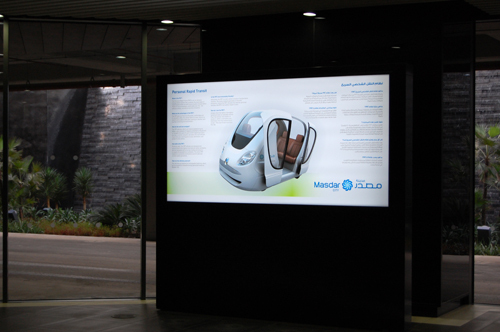 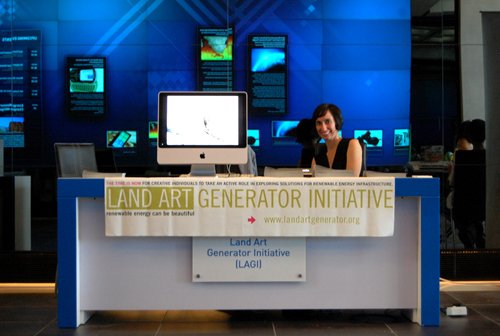 We were very honored to have been invited to present LAGI at the first ever Masdar Market Day event which took place yesterday. 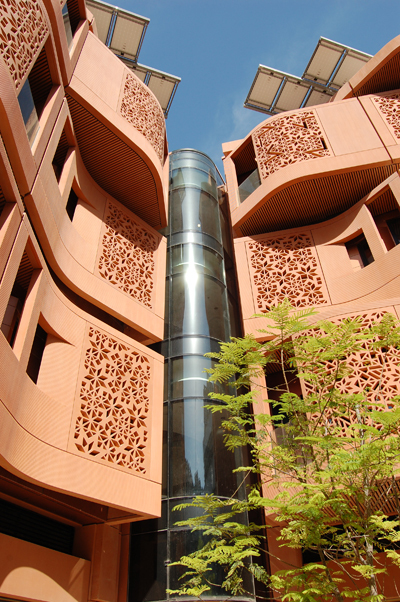 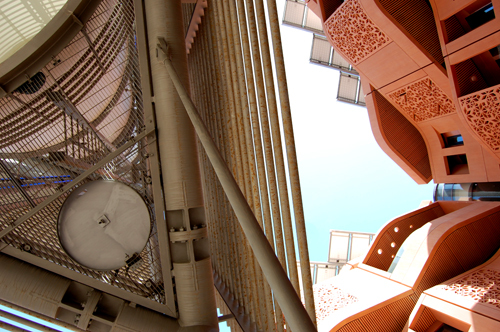 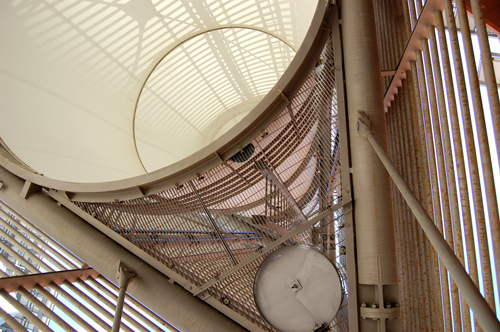 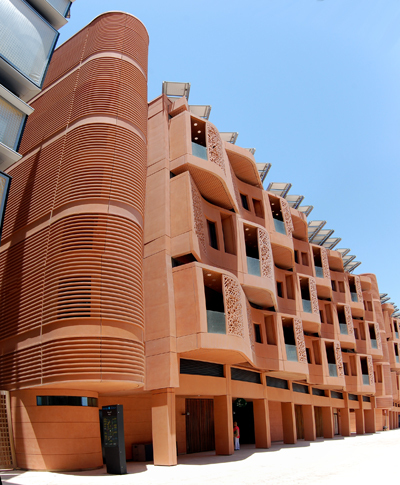 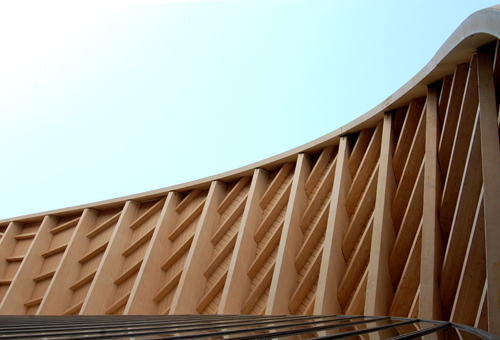 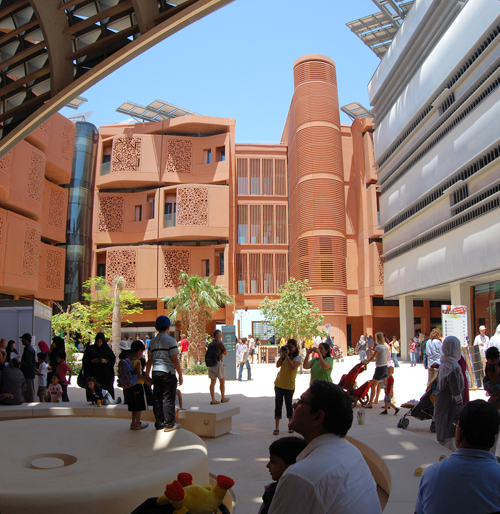 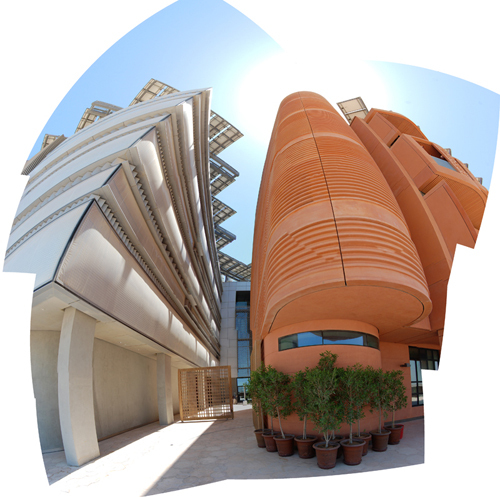 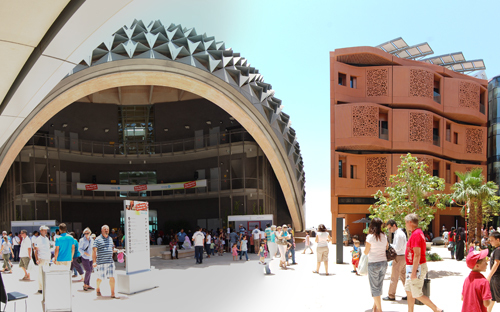 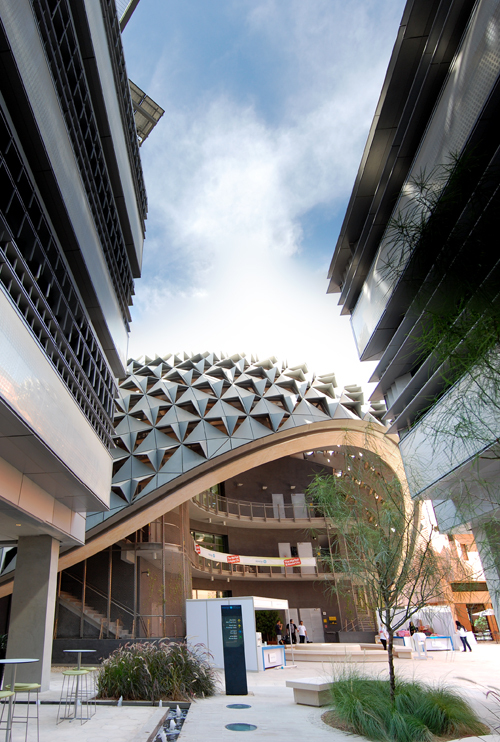 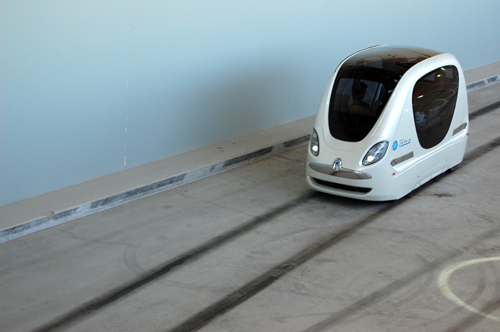 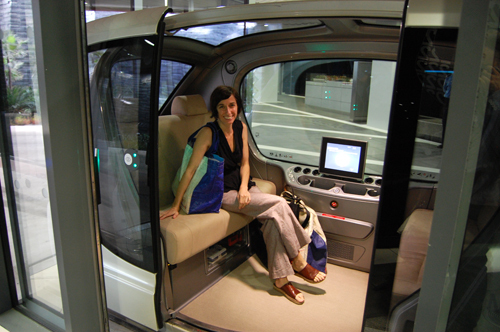 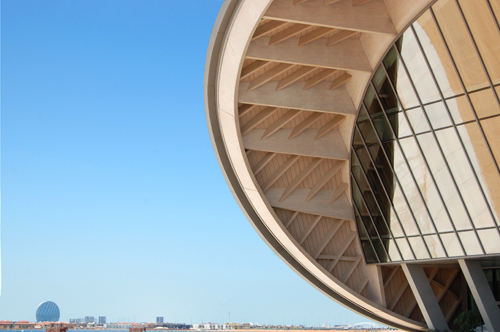 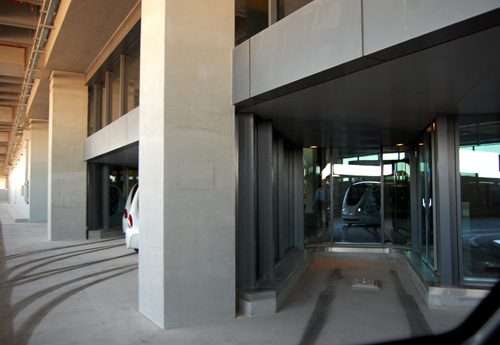 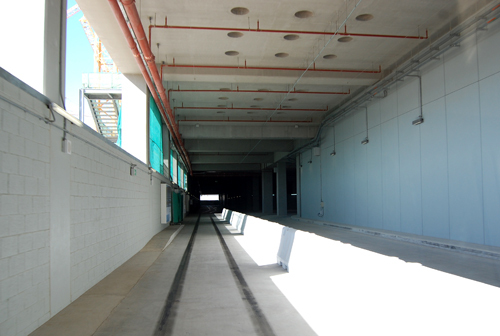 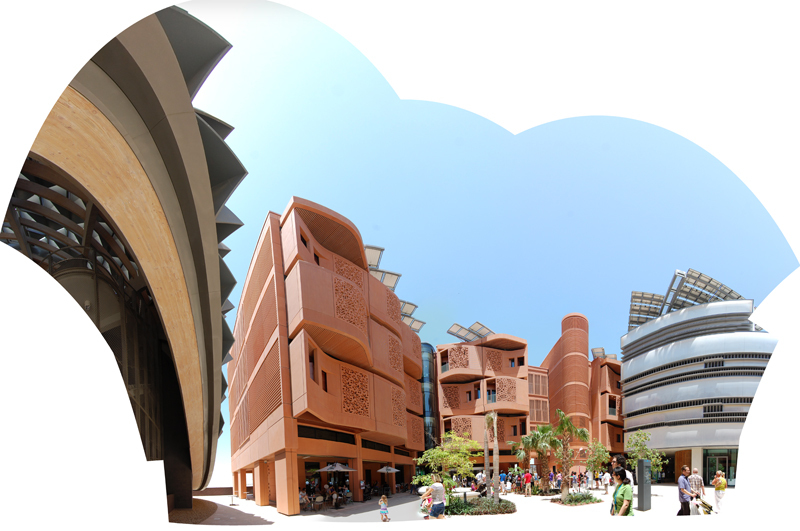 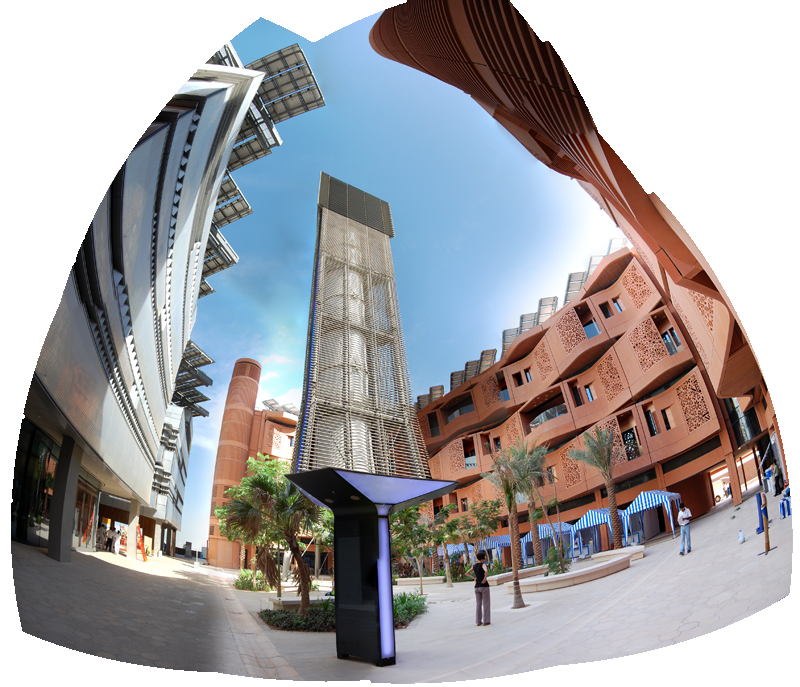 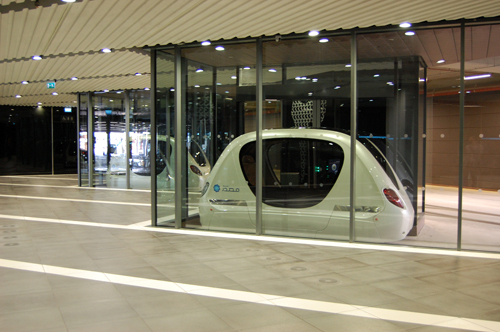 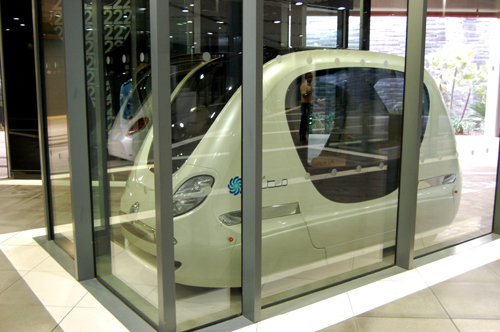 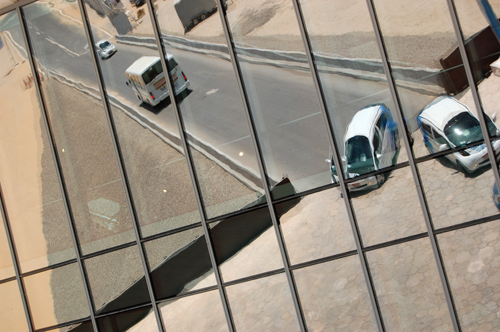 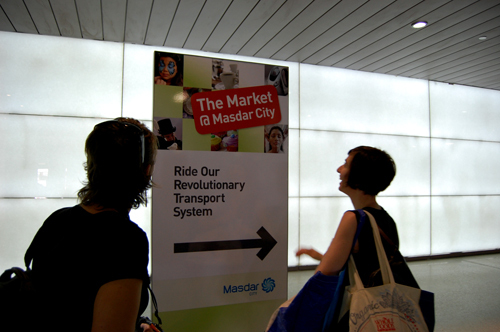 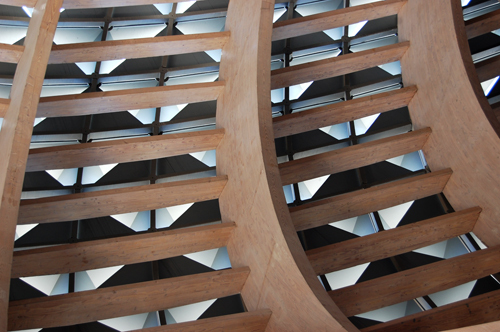 It was our first opportunity to ride the PRT and see the completed Masdar Institute of Science and Technology buildings, the first phase of the overall Masdar City project. 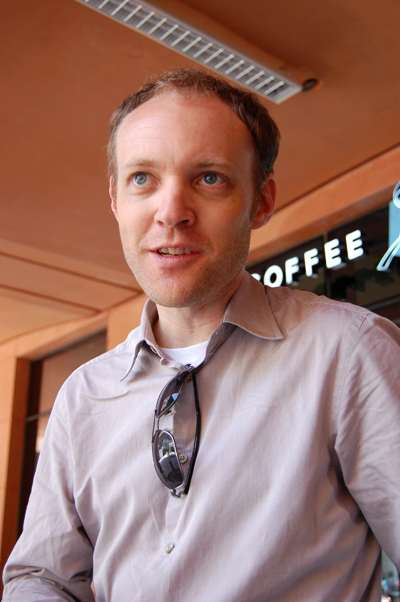 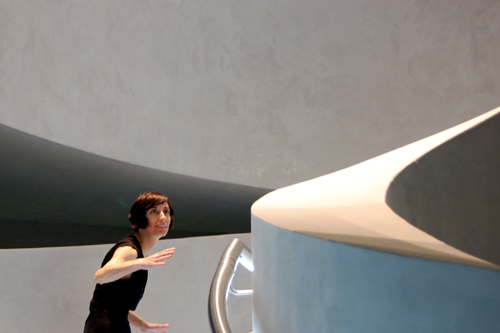 We had a great time exploring the sustainability with Tafline Laylin, Managing Editor at Green Prophet, contributing writer at Inhabitat, and our new best friend and green journalism hero. 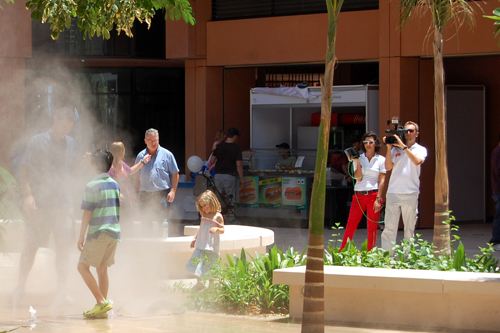 The misting courtyard was a big hit. 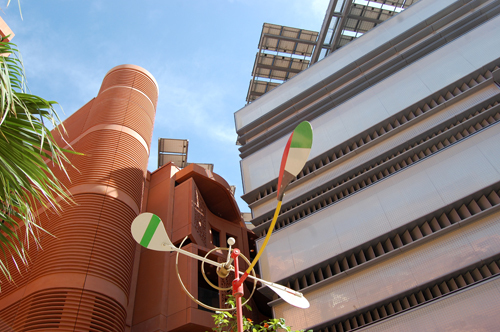 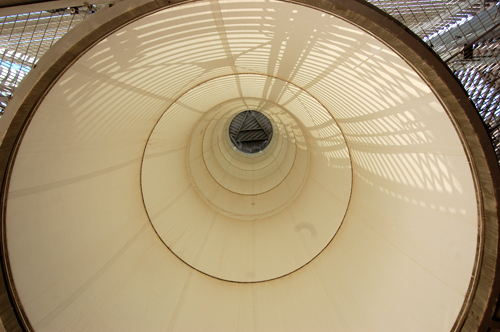 Evaporative cooling works. 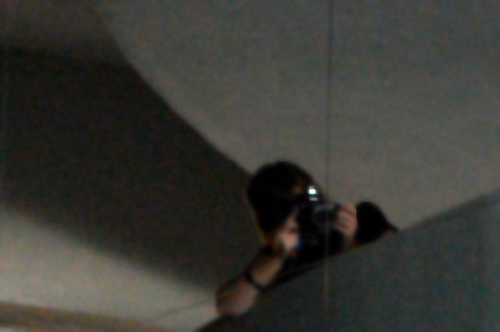 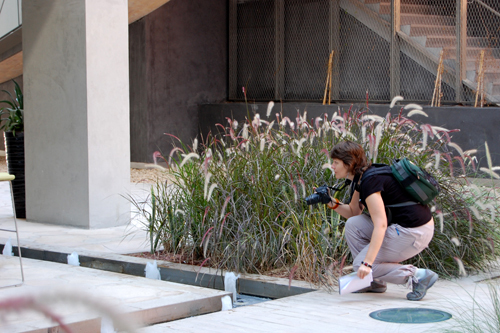 Tafline hunting down the perfect photo. 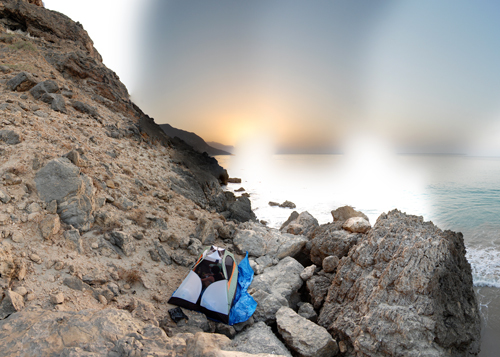 We’ve been wanting to go on this adventure for a long time and we finally had the time that it deserved. 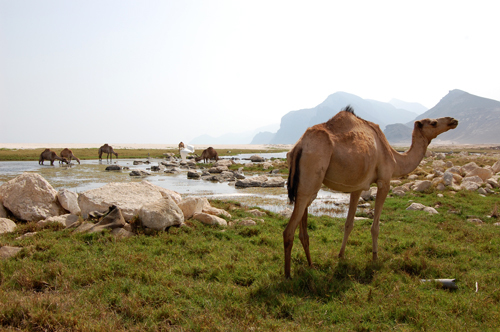 It’s a twelve hour drive to Salalah from Dubai. 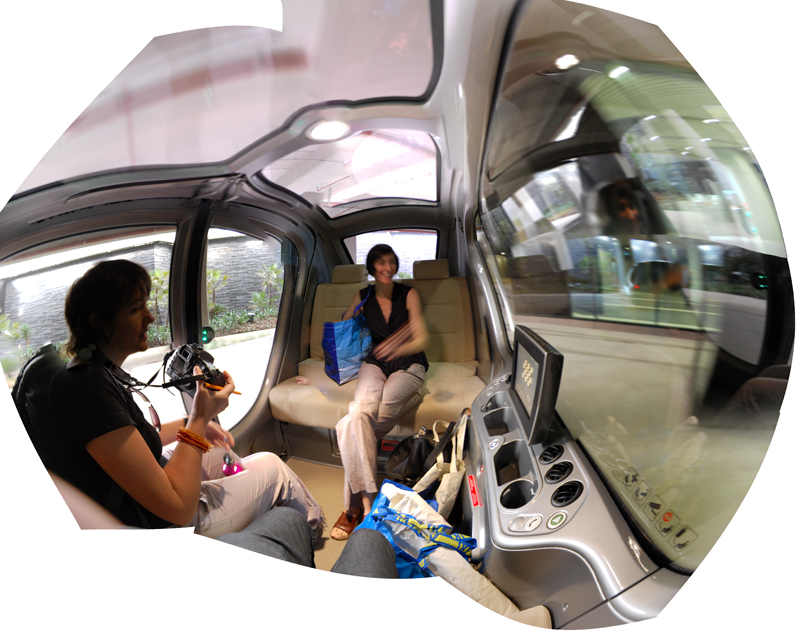 Apologies about how long this post is, but we took a lot of pictures since we may not be making this journey too often. 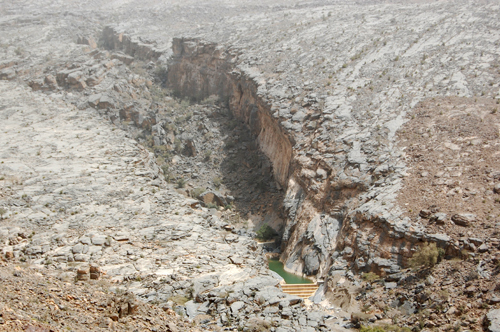 But having done it once, it is very tempting…on the way back we were trying to determine if it would be worth making the drive on a three day weekend. 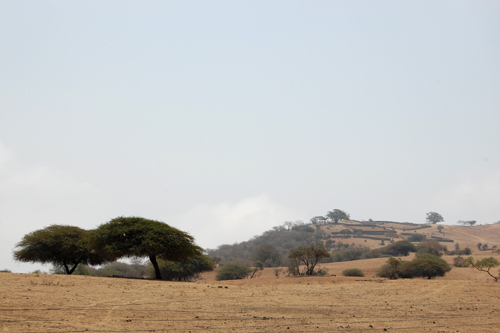 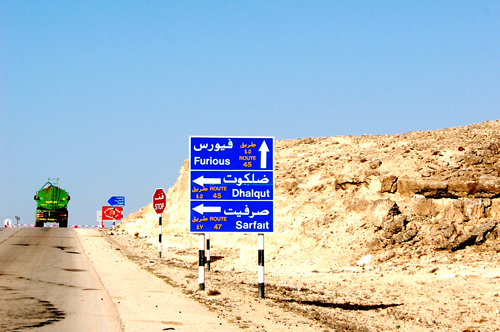 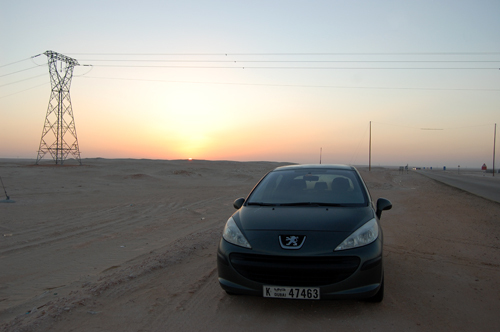 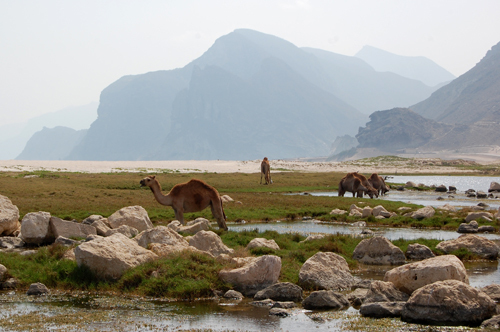 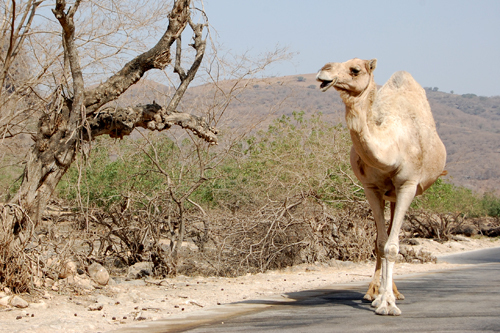 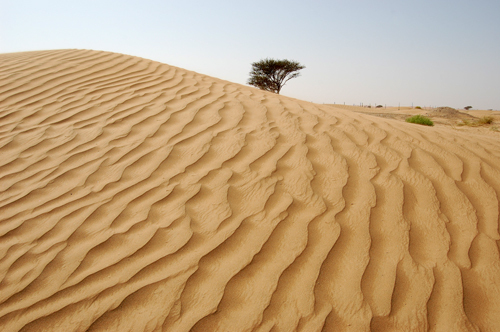 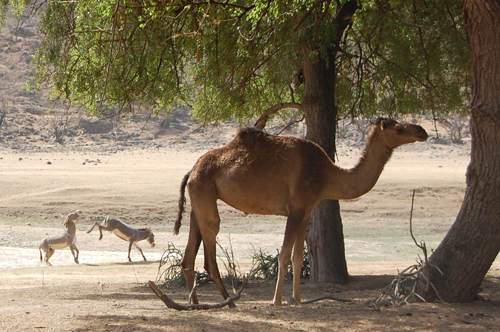 The drive down to Salalah takes you along the edge of the Rub’ al Khali, the Empty Quarter of the Arabian Peninsula. 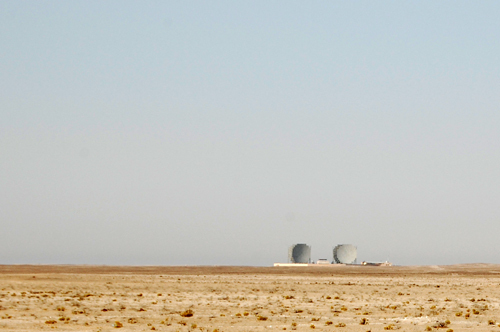 Interesting satellite receiver equipment in the middle of nowhere. 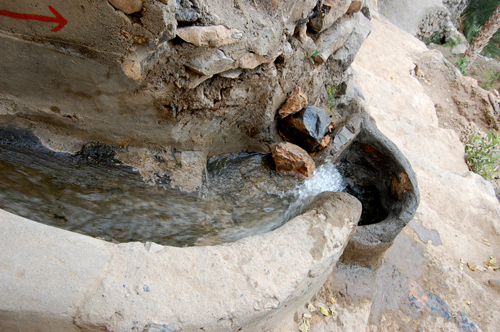 Kuot Hmran. 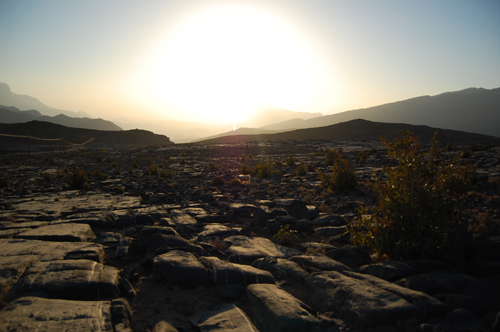 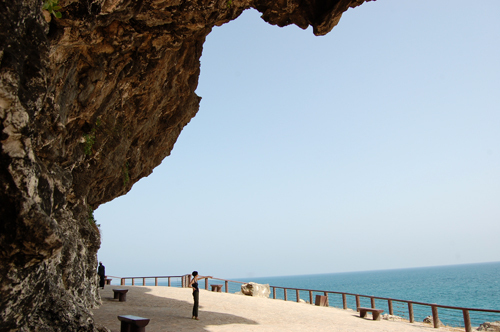 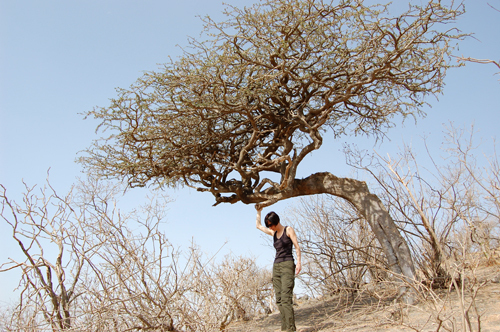 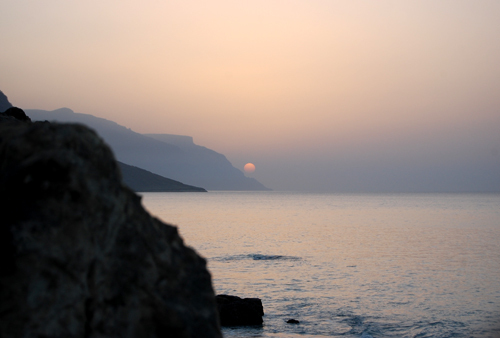 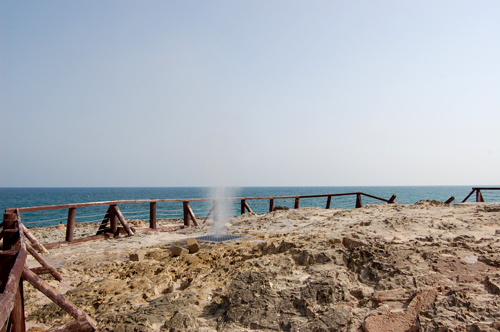 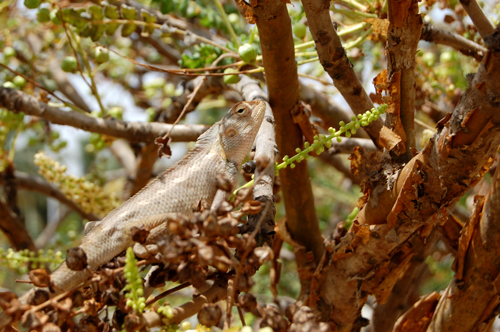 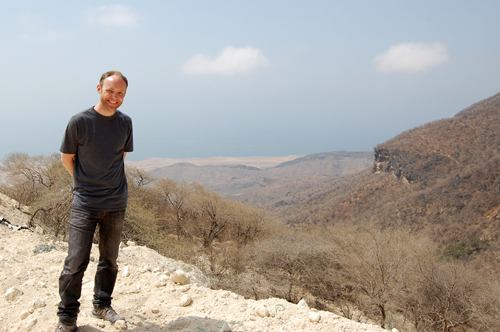 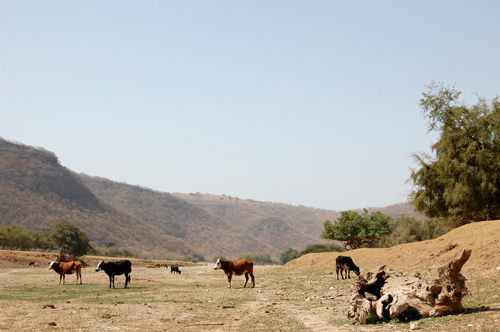 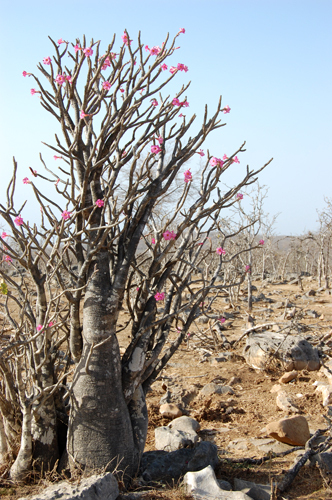 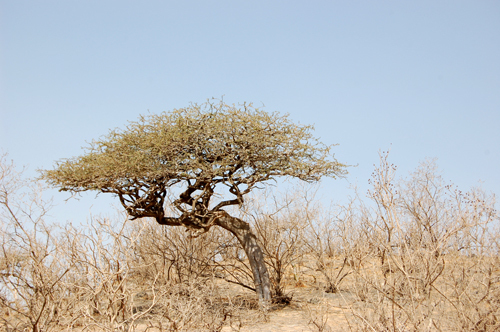 East of Salalah. 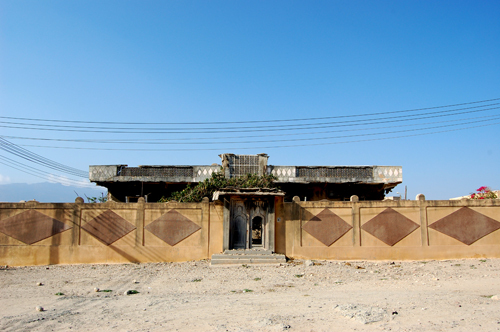 Not sure what the significance of this house is. 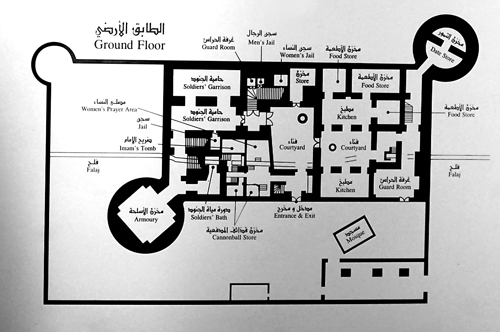 But it is a splendid elevation. 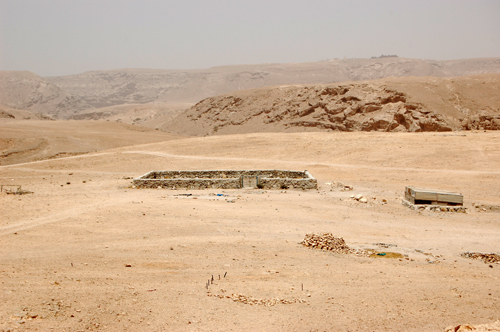 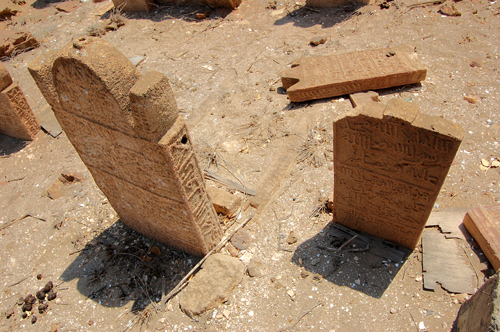 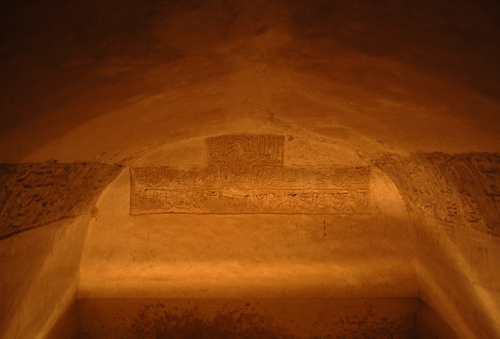 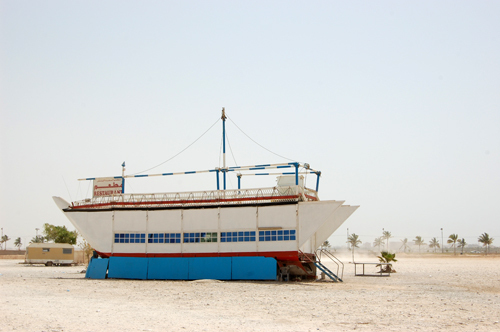 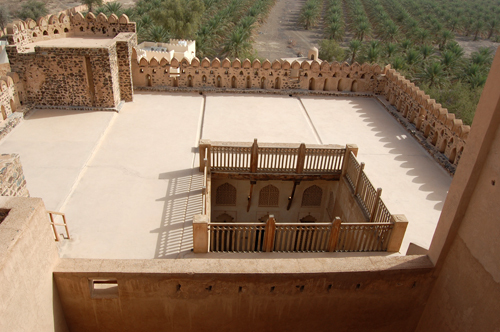 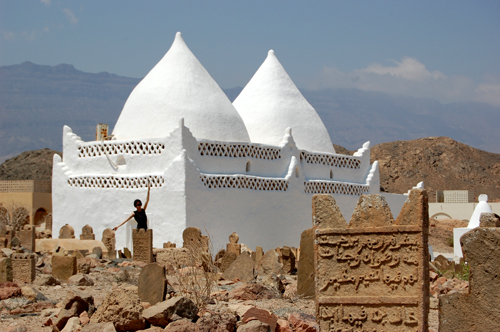 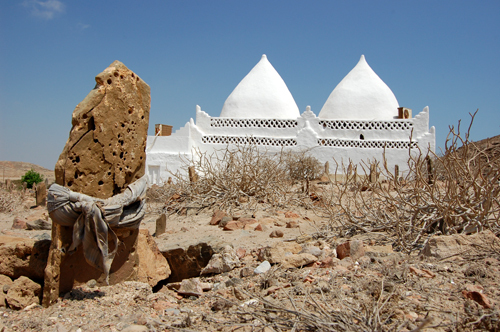 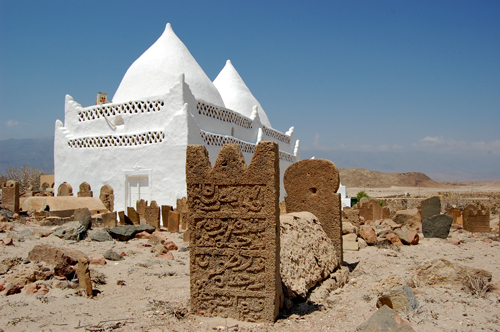 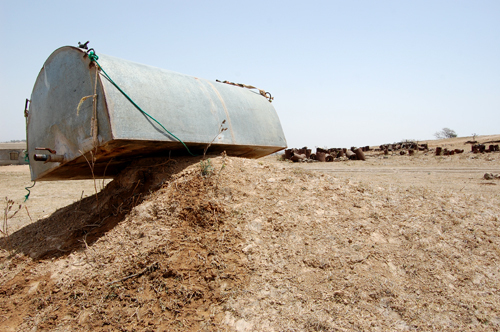 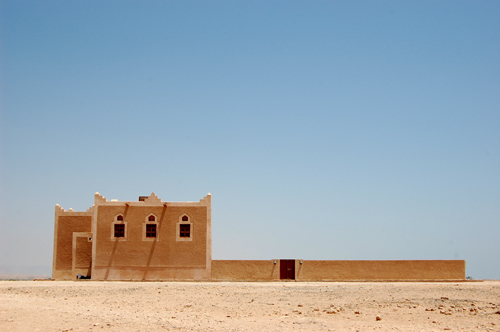 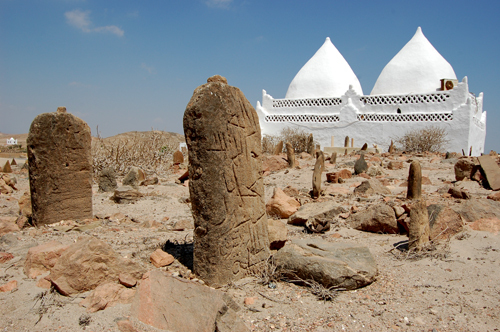 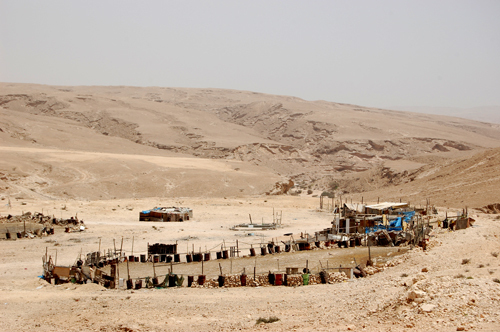 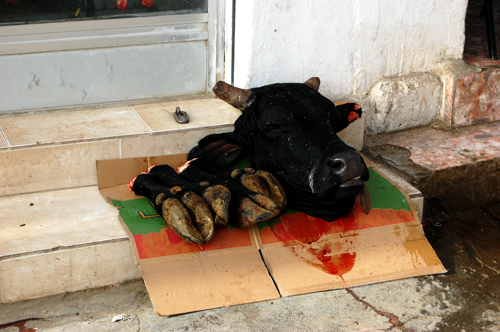 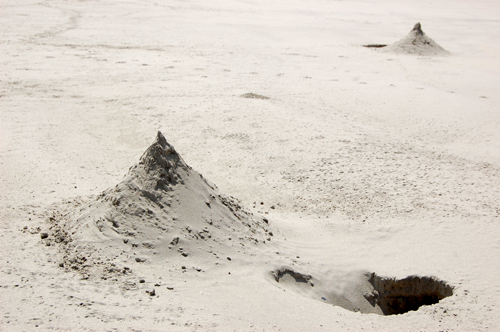 The Tomb of Mohammed Bin Ali is just outside of Mirbat and is surrounded by an ancient graveyard. 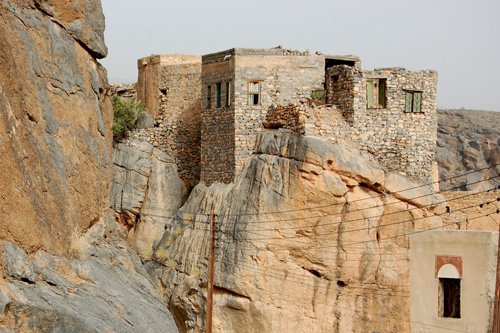 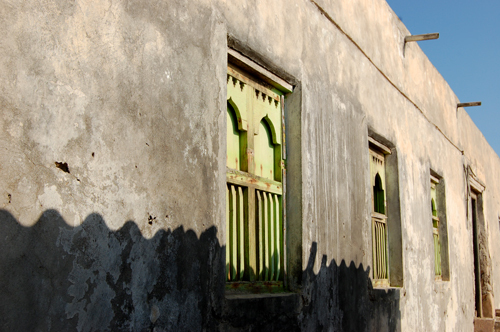 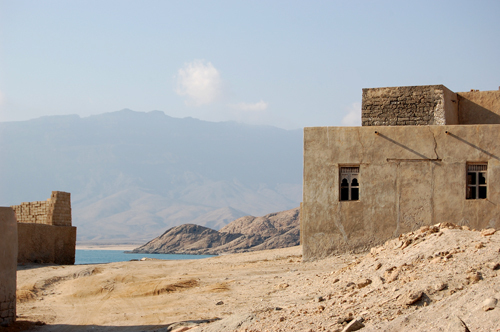 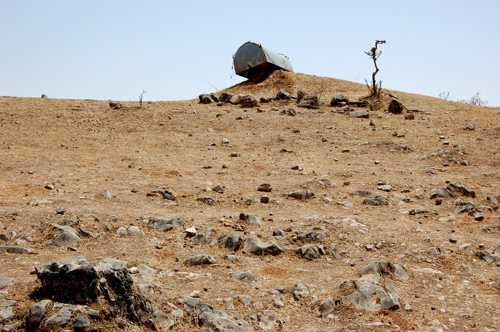 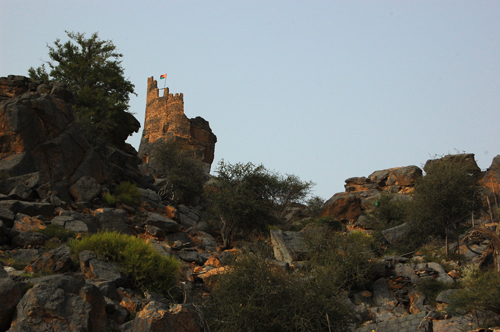 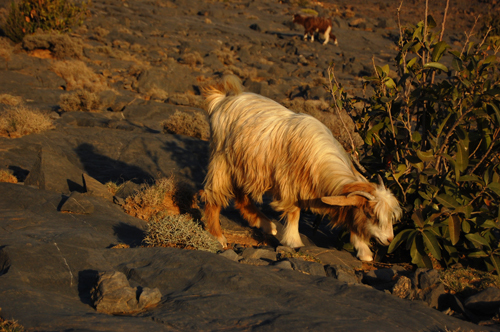 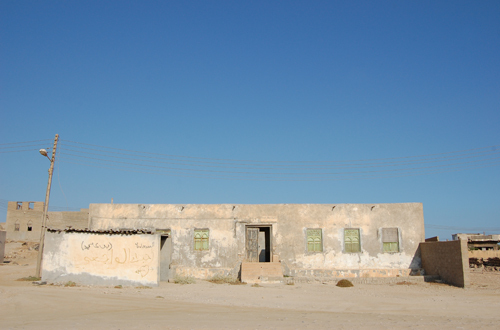 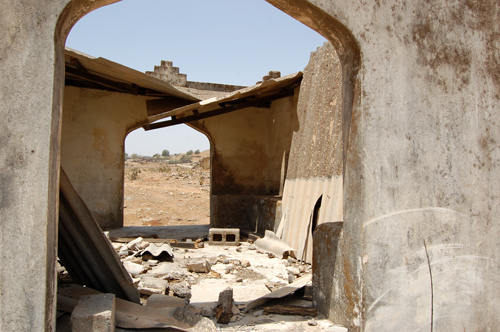 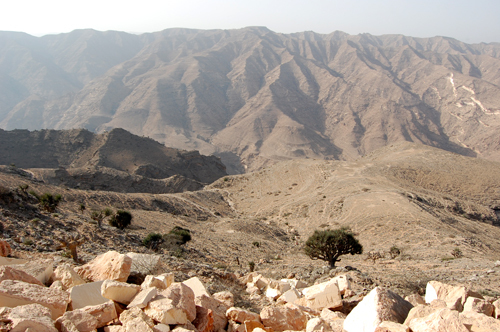 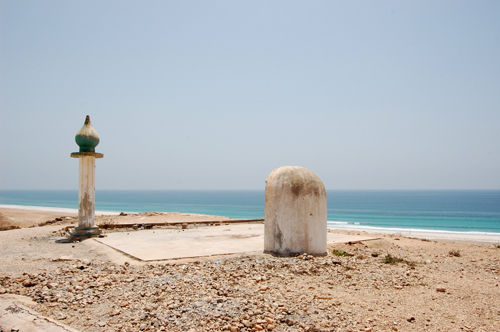 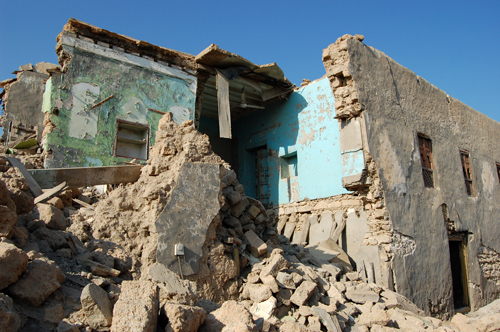 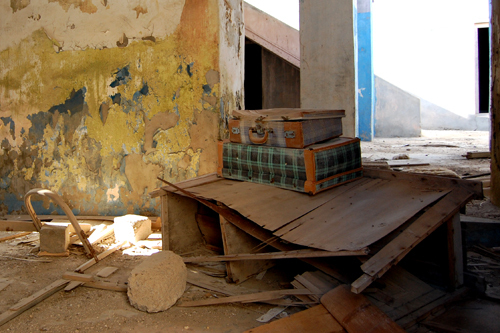 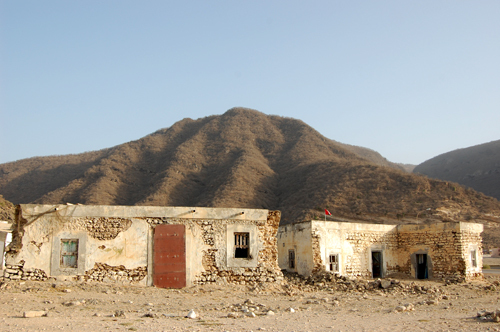 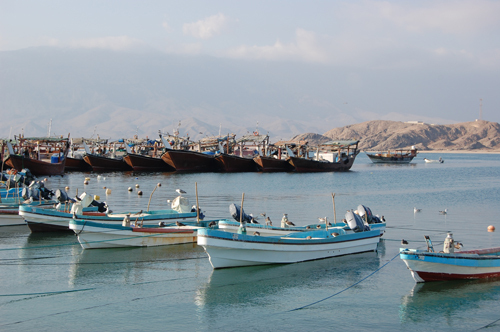 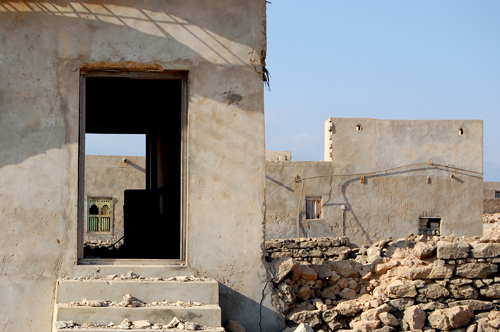 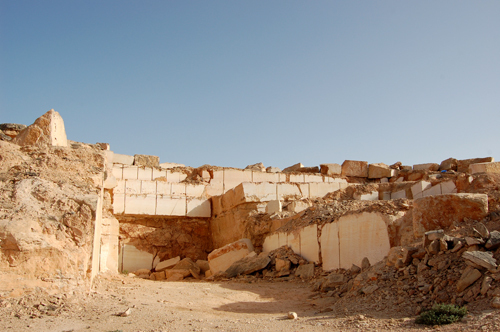 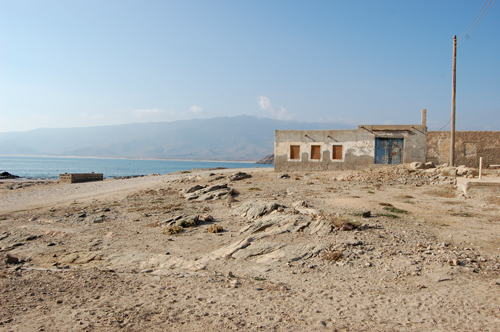 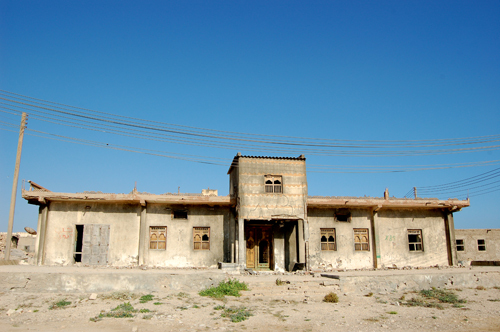 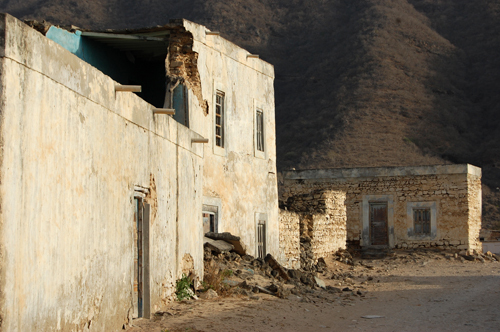 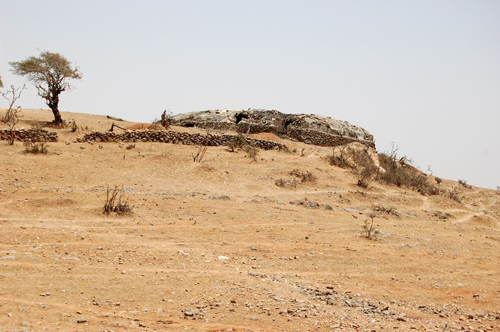 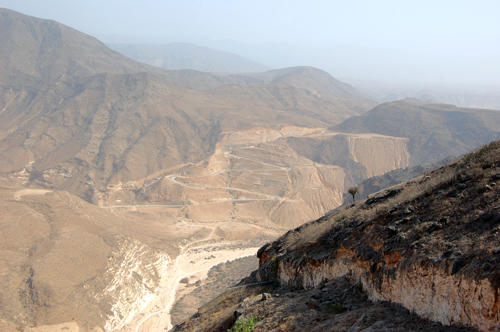 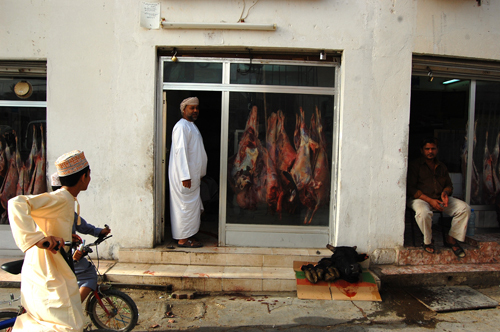 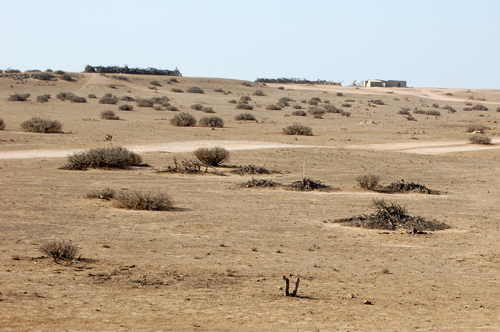 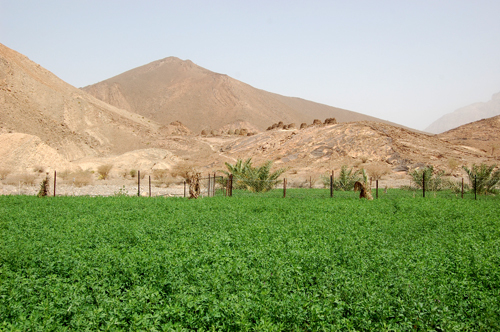 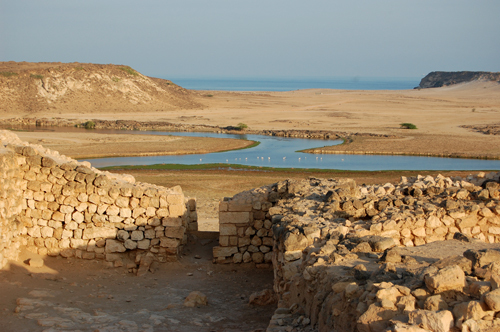 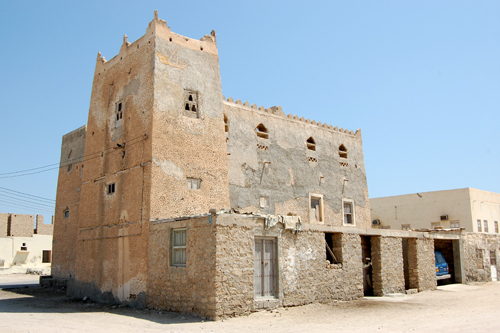 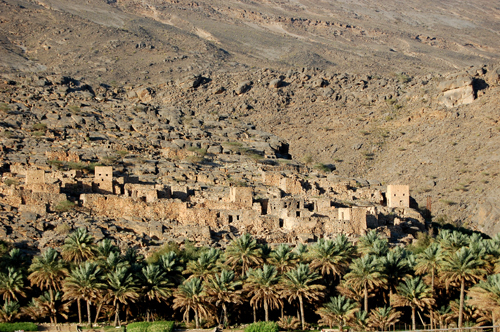 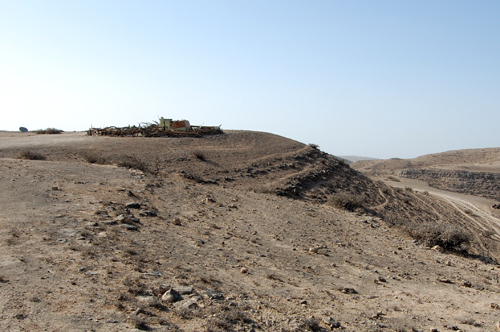 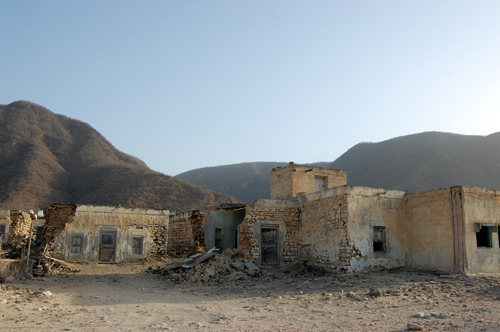 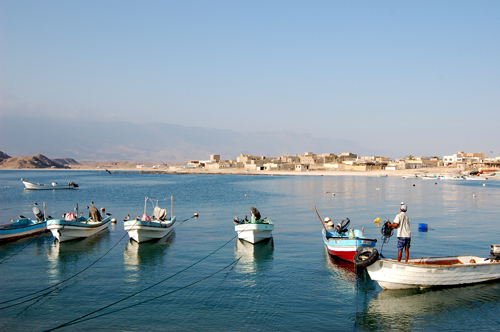 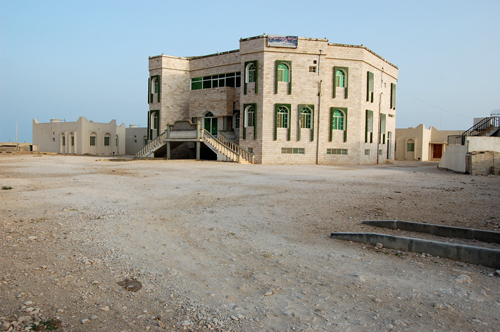 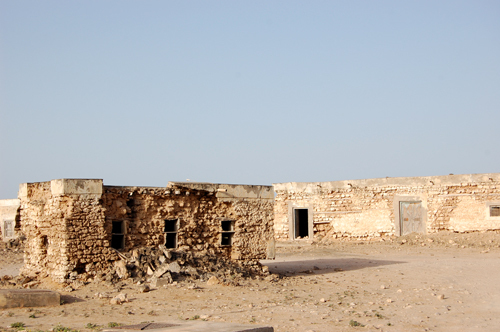 The town of Mirbat is most well known for the battle that was fought here in 1972 during the Dhofar rebellion. 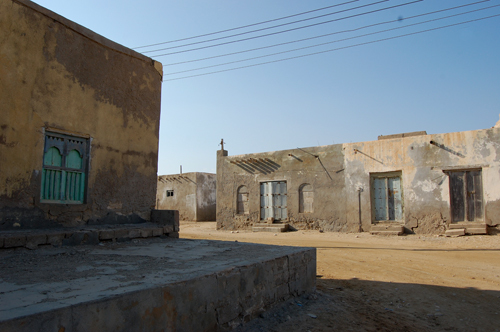 Much of the town is in ruins to this day which seem to stand as sort of an unofficial monument while the rest of the town has grown up around them. 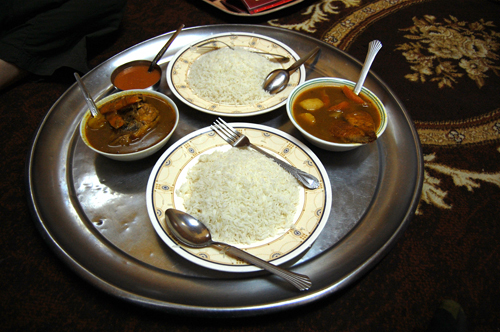 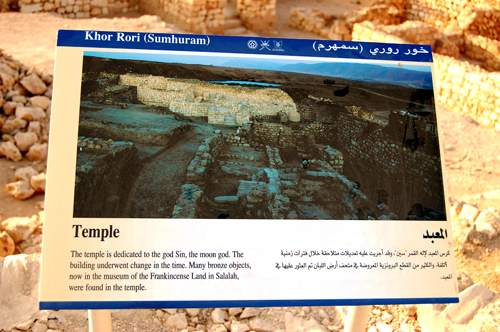 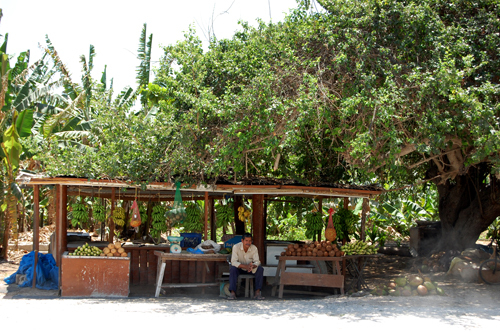 Khor Rori, or Sumharam. 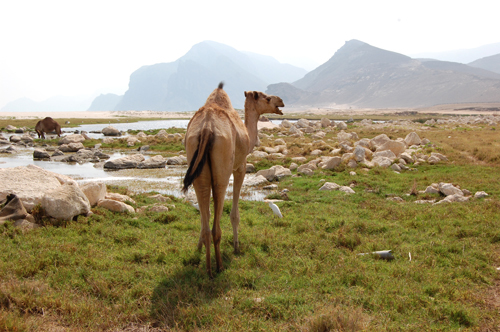 East of Salalah. 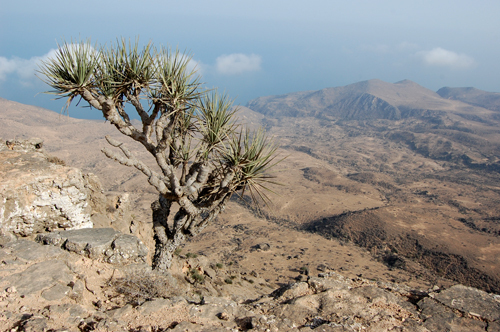 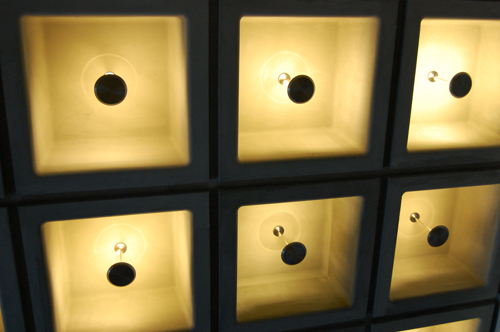 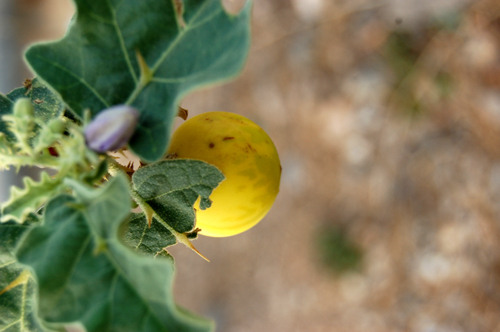 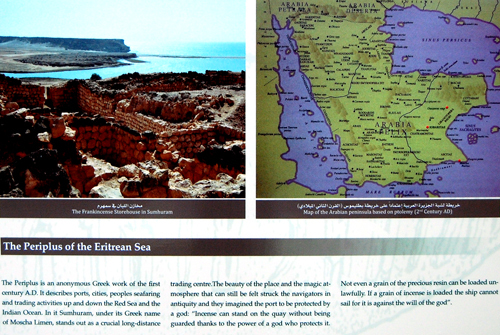 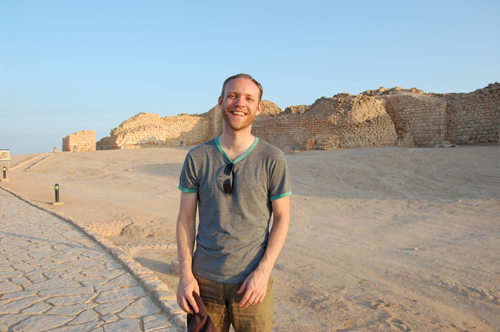 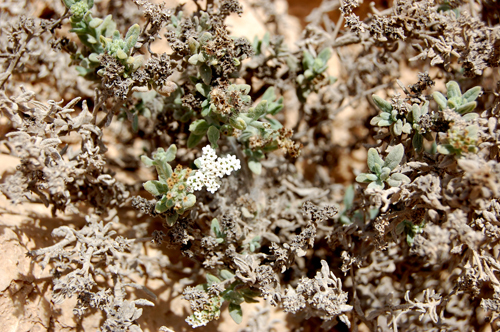 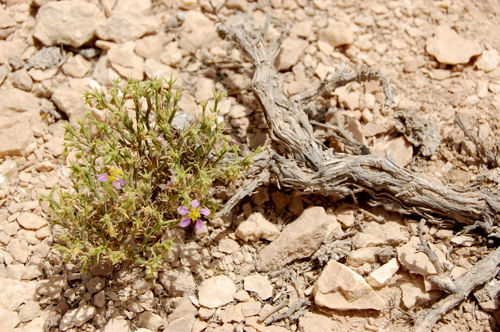 Trading hub for Frankincense from 3rd century BCE to 7th Century CE. 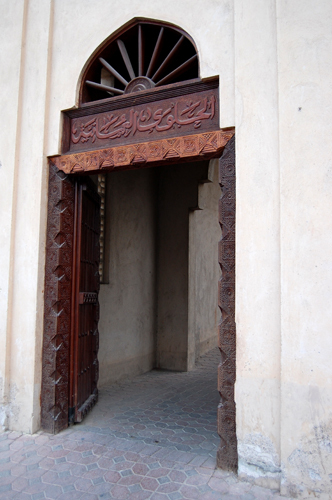 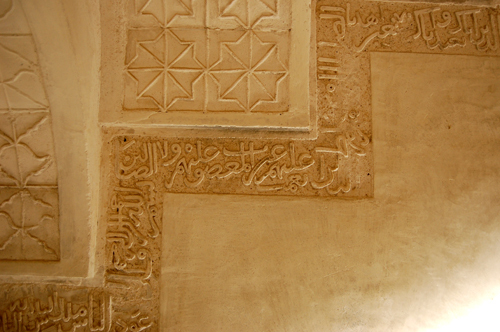 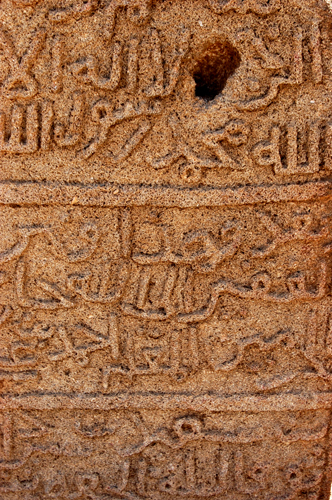 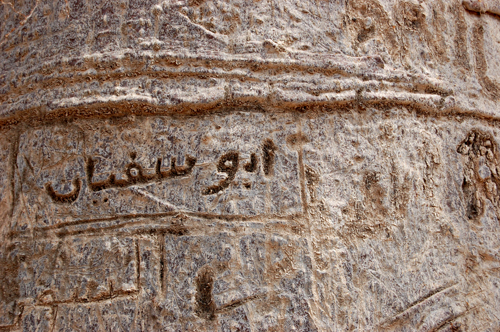 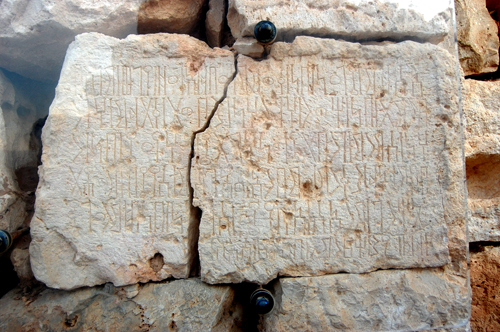 Ancient Southern Arabic language inscribed on the gates of Sumharam. 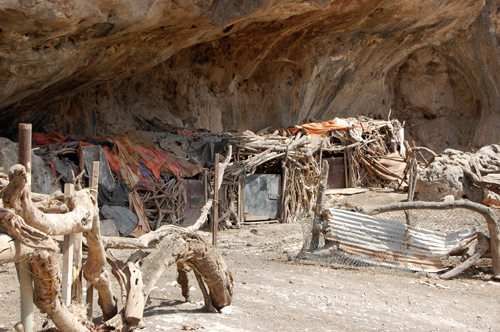 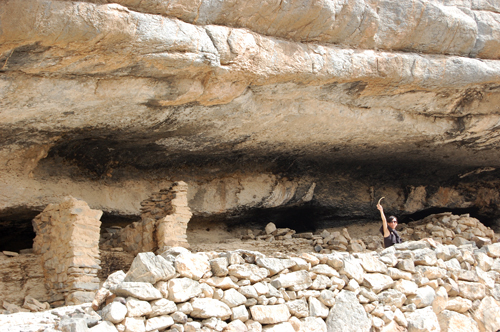 Some more modern cave dwellings near Mirbat. 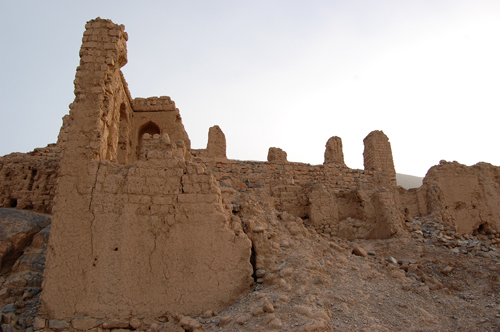 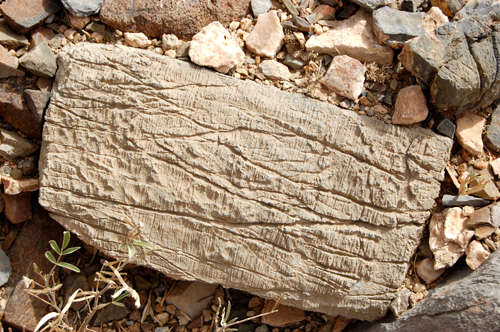 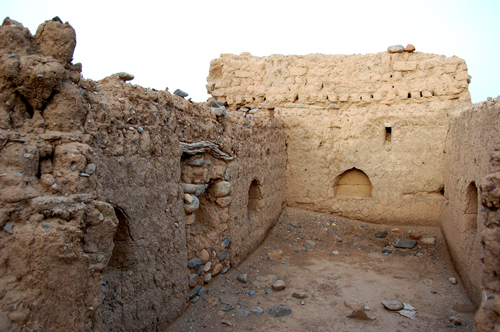 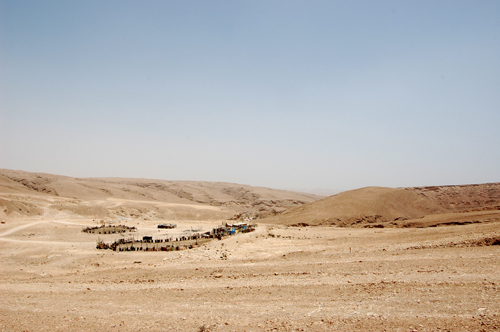 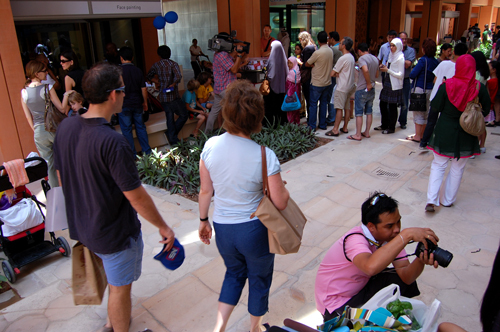 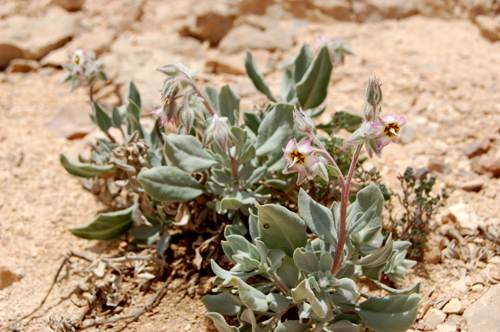 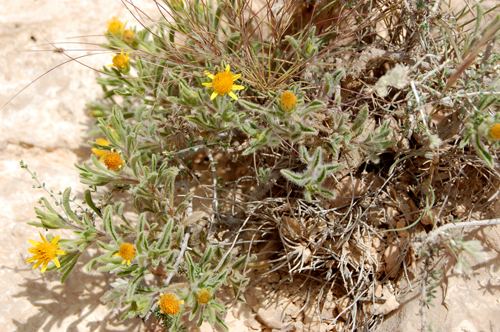 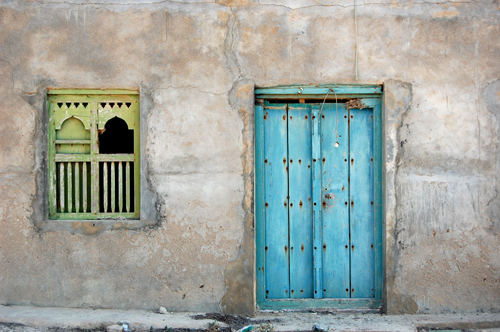 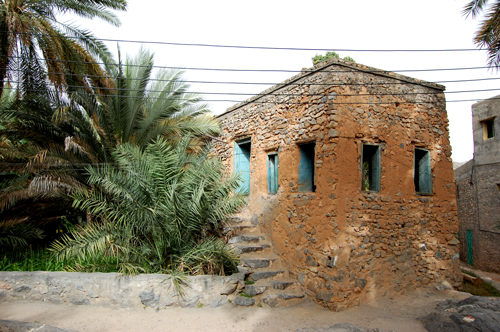 Wadi Darbat. 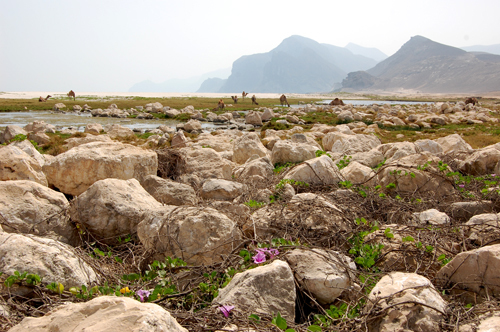 East of Salalah. 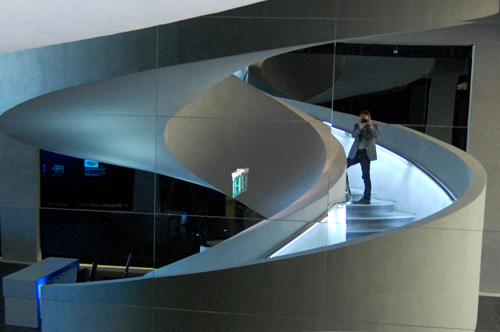 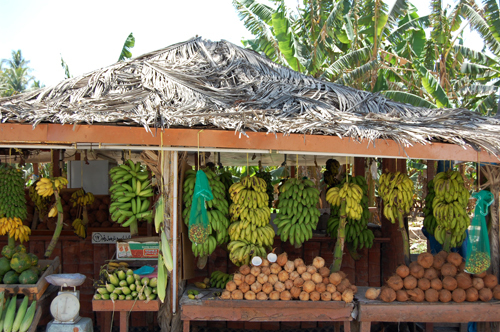 This place was a magical garden of Eden. 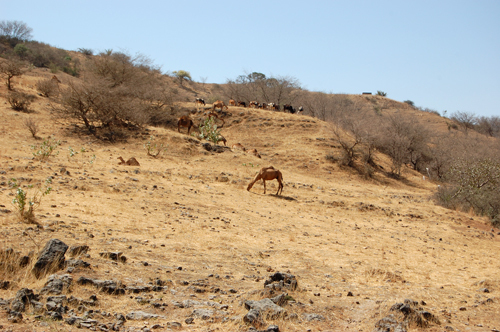 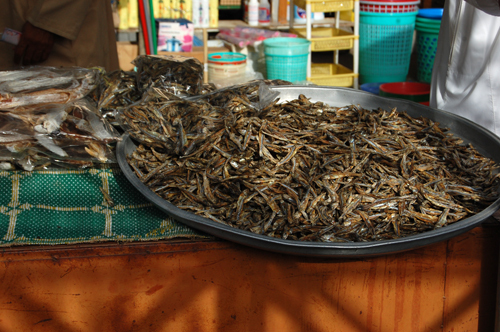 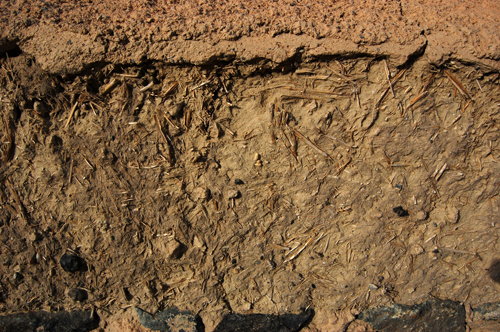 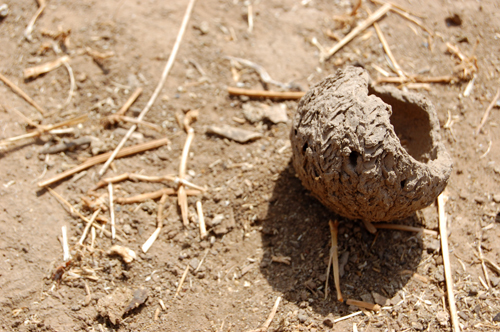 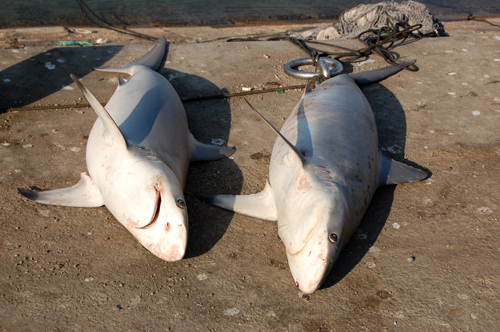 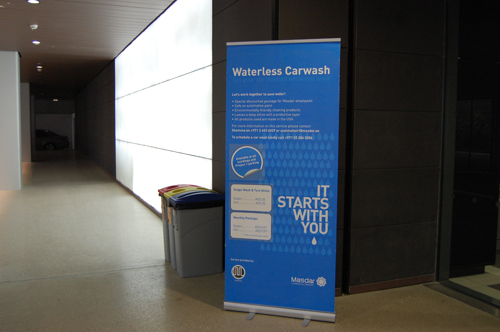 We were there during the dry season. 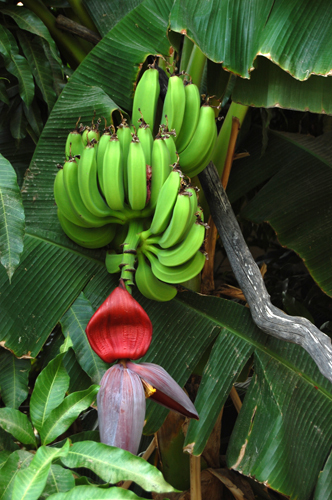 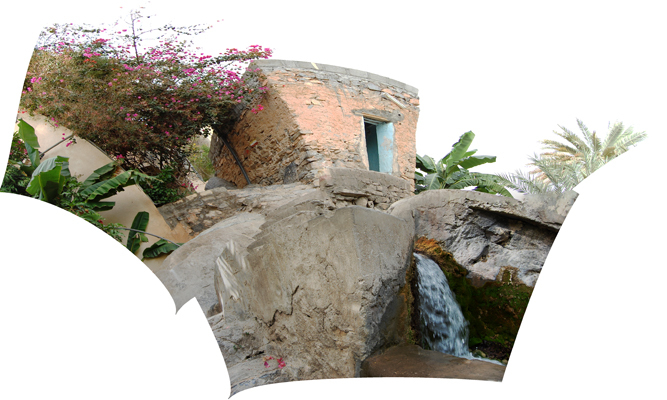 In the summer during the rains it fills up with water and turns lush with green everywhere. 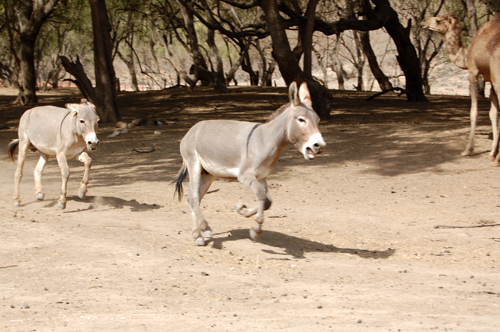 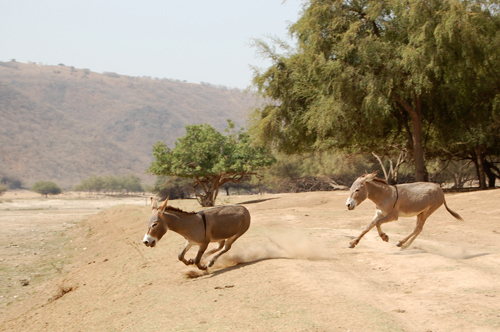 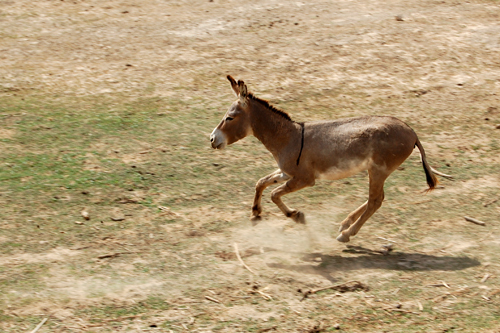 The young donkeys were having a blast chasing each other. 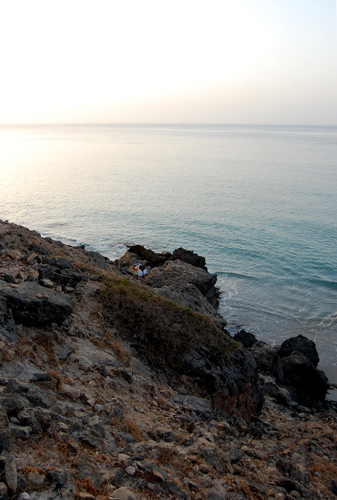 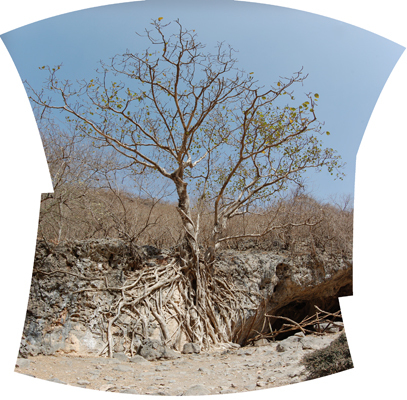 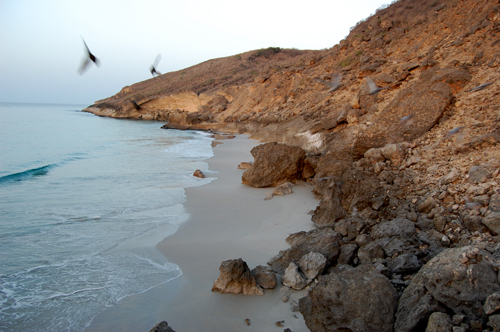 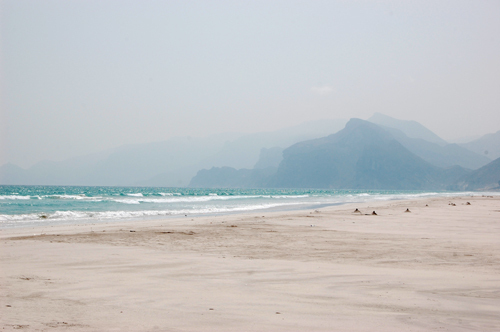 Beach near Mughsayl, West of Salalah. 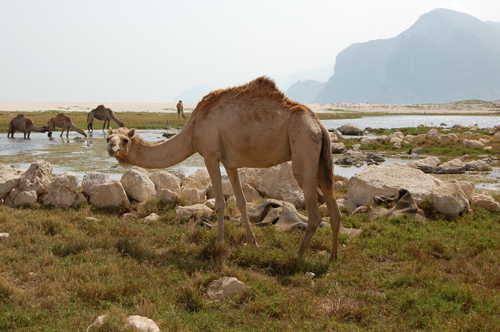 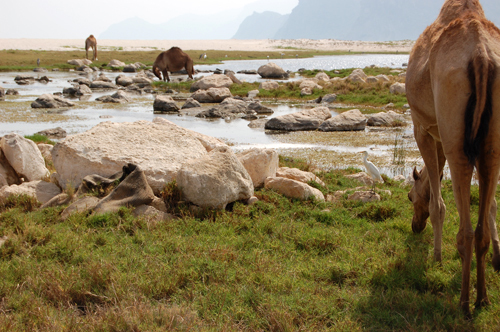 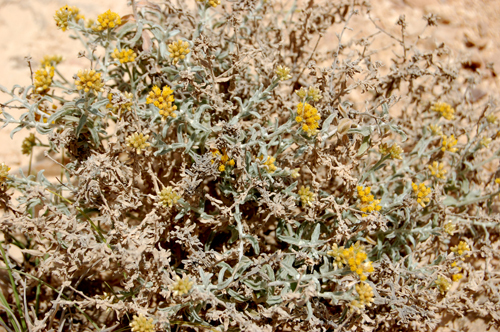 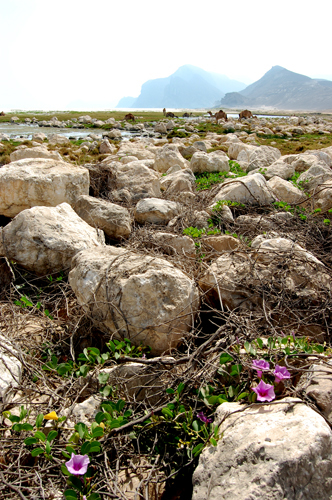 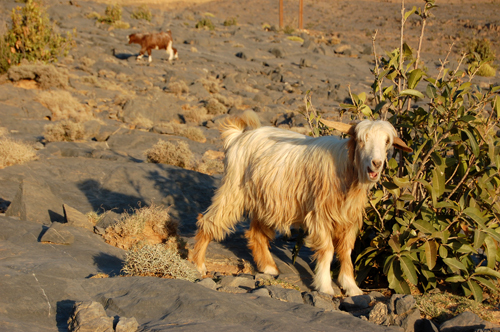 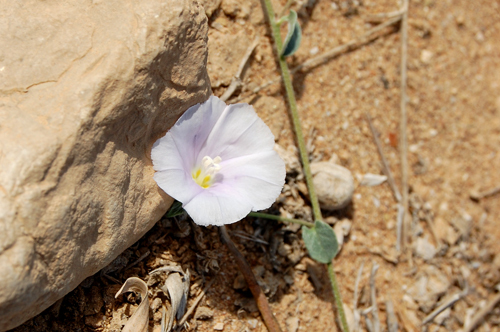 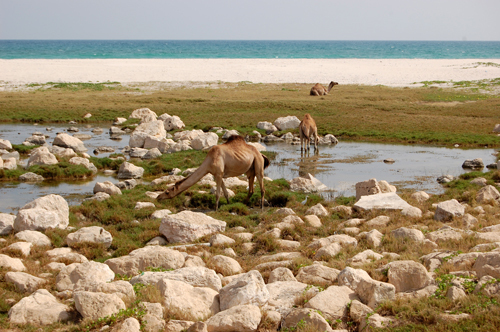 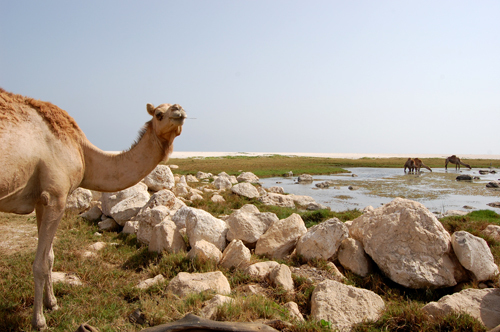 Yes, there were camels and heron chilling near the beach on the marshy rocks with creeping wild purple flowered vines. 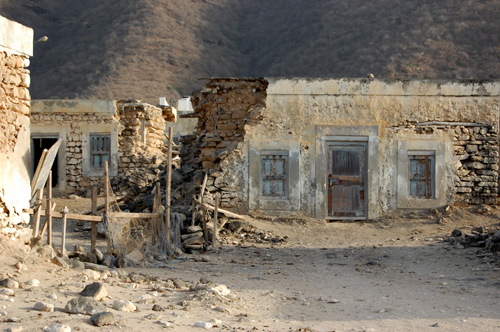 Rakhyut is where we spent the night. 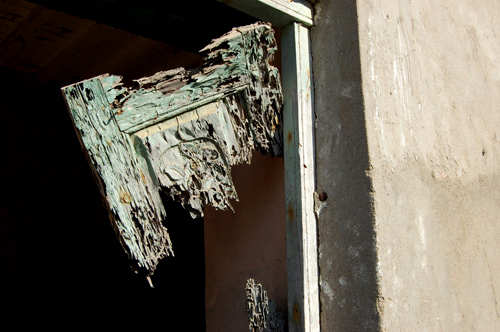 But not in this hotel. 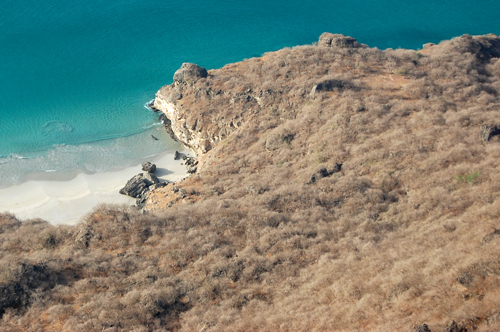 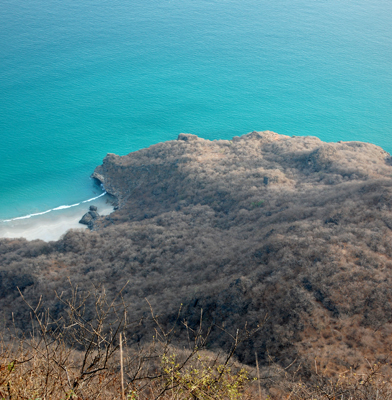 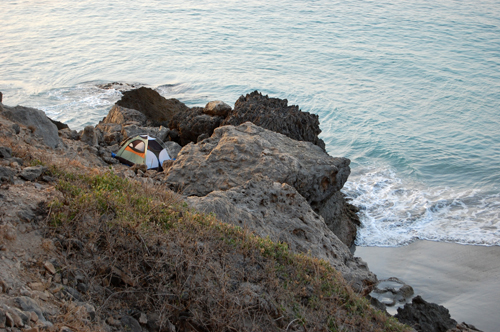 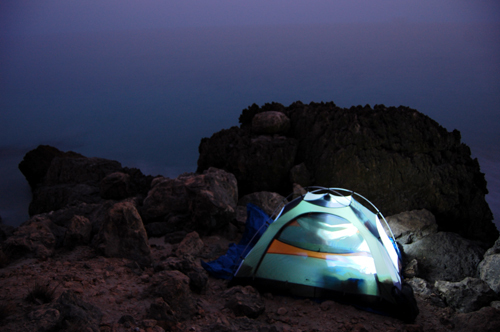 We pitched our tent on an outcropping of rocks overlooking the beach where the dolphins were swimming all evening. 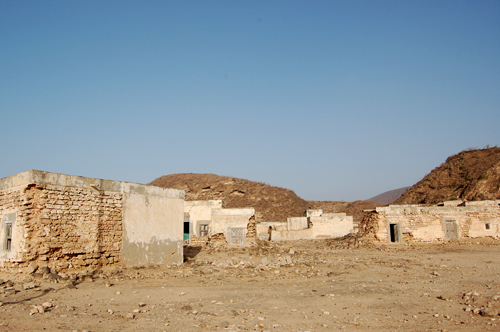 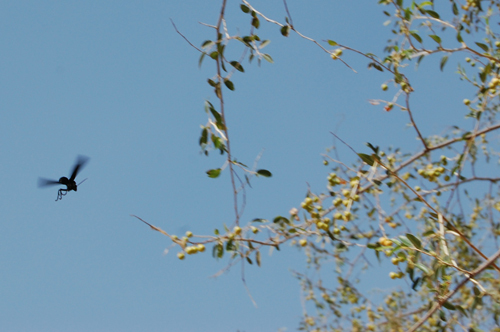 Photos of Rakhyut village in the morning. 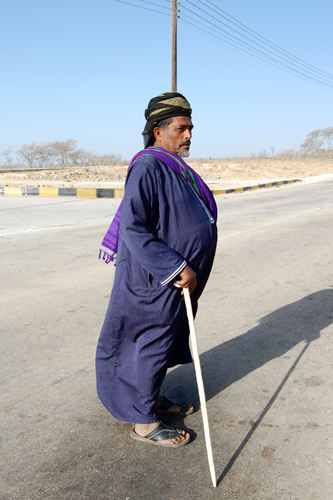 We gave this man a lift to the top of the mountain. 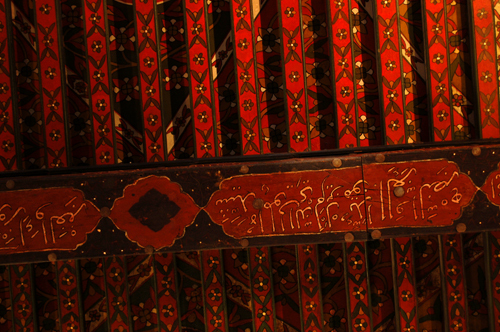 He was quite an amazing and regal personality. 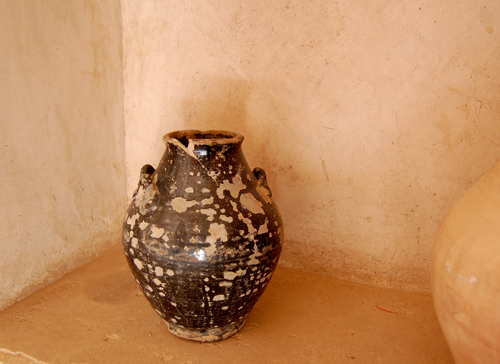 I wish we could have conversed beyond greetings and hand gestures. 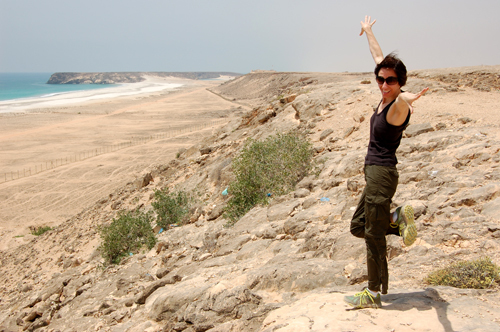 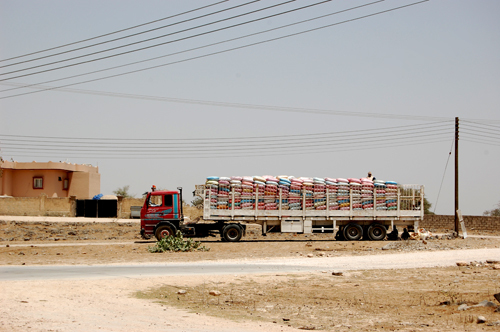 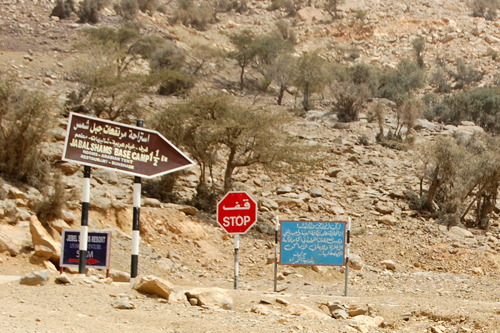 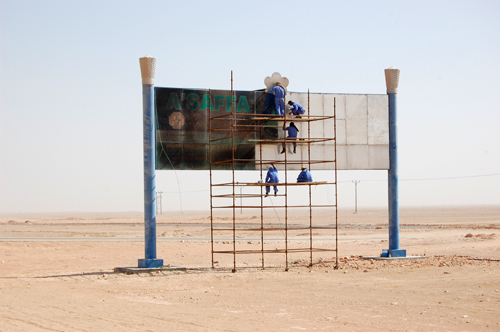 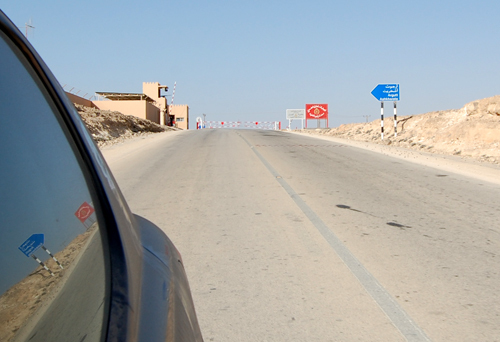 This was a far as we could get before we were turned around at the Omani side of the Yemen border crossing. 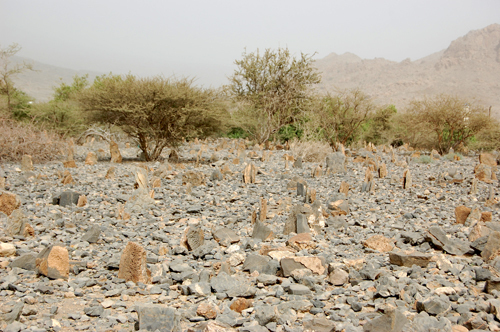 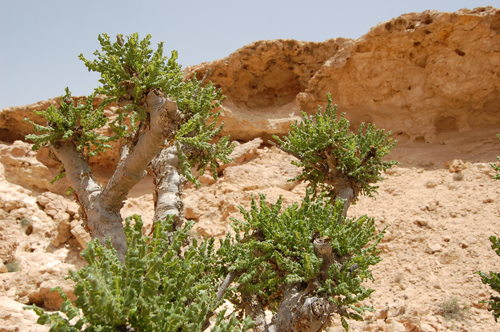 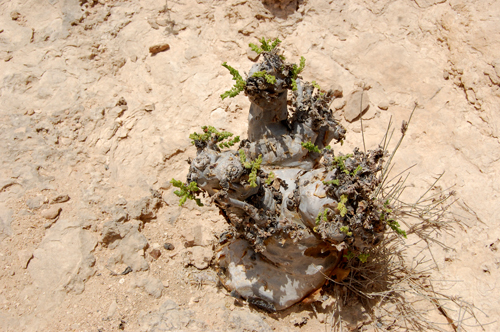 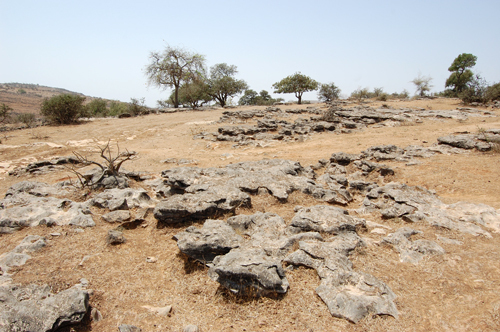 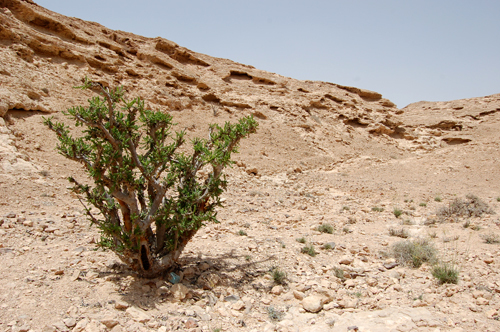 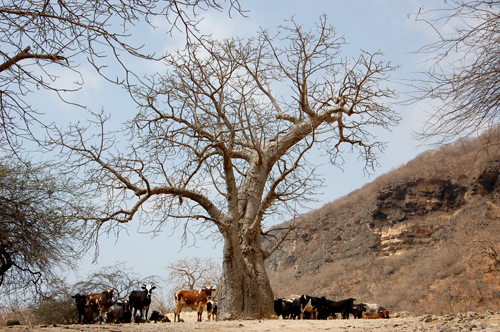 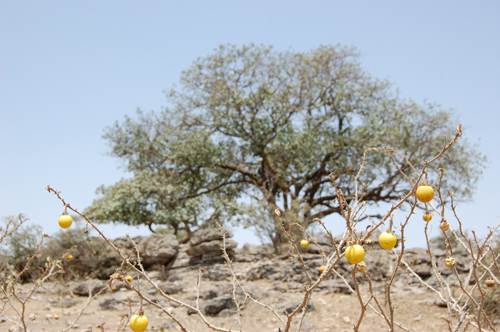 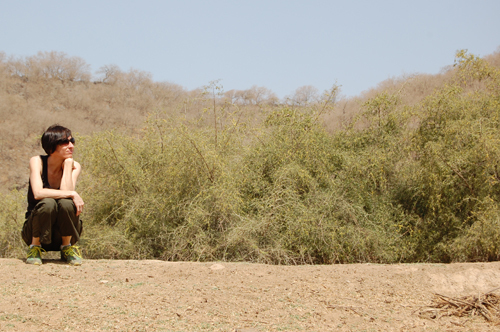 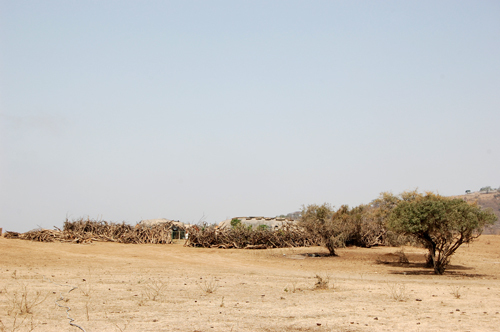 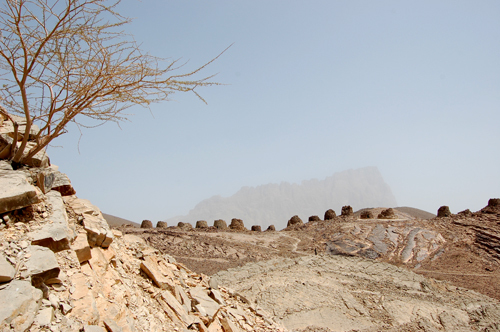 Frankincense trees near Wadi Uyun. 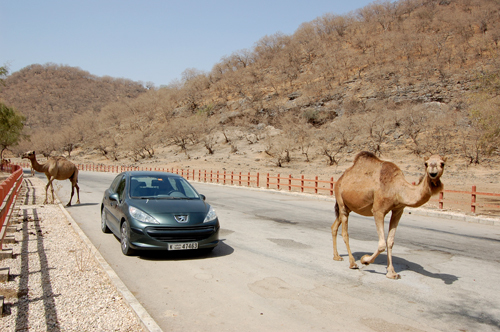 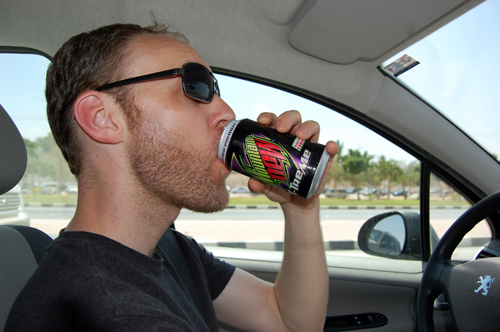 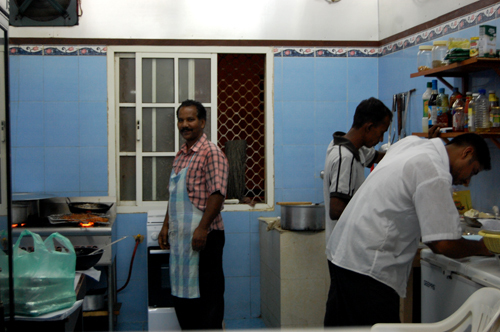 We stopped over in Nizwa on our way to and from Salalah. 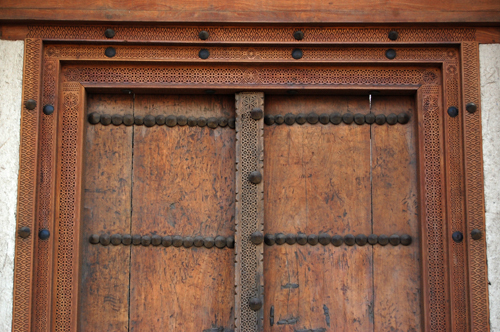 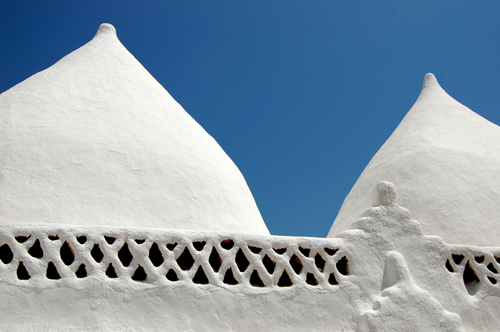 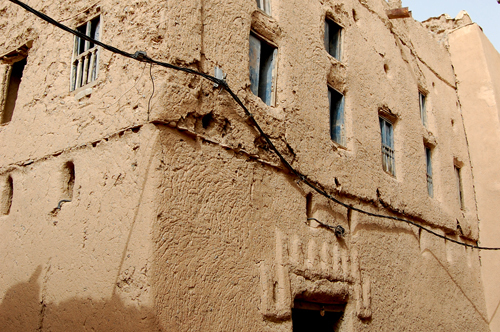 We didn’t expect that Nizwa would hold as many secrets as it does. 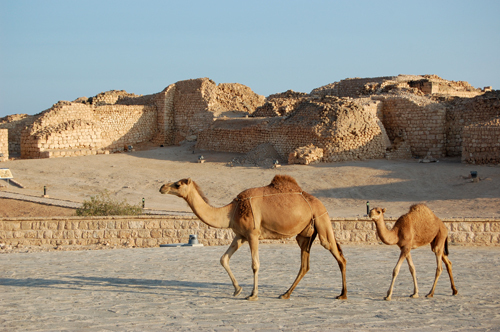 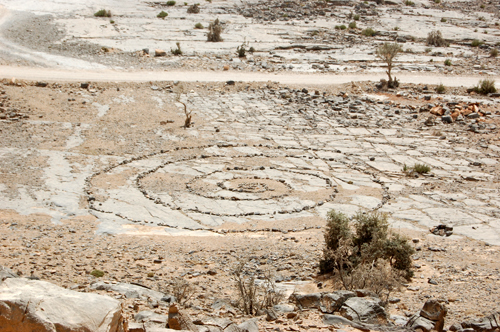 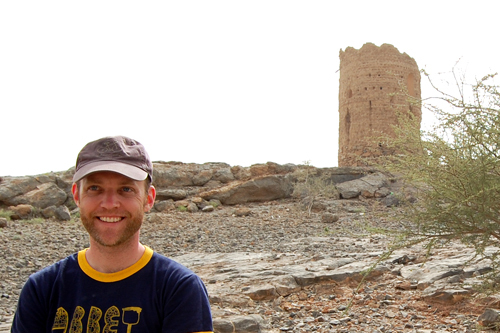 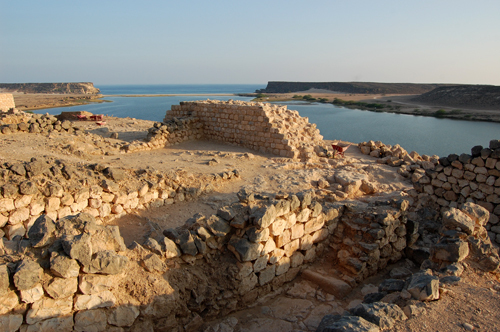 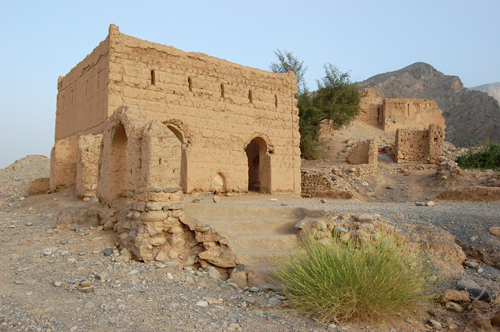 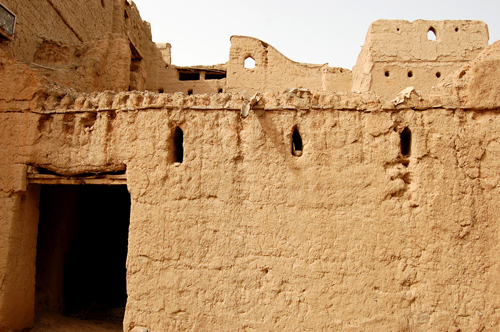 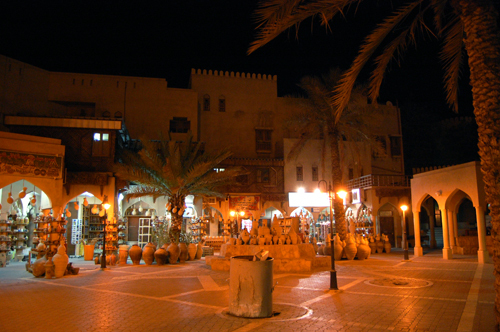 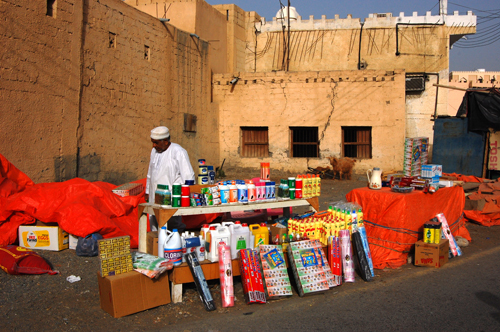 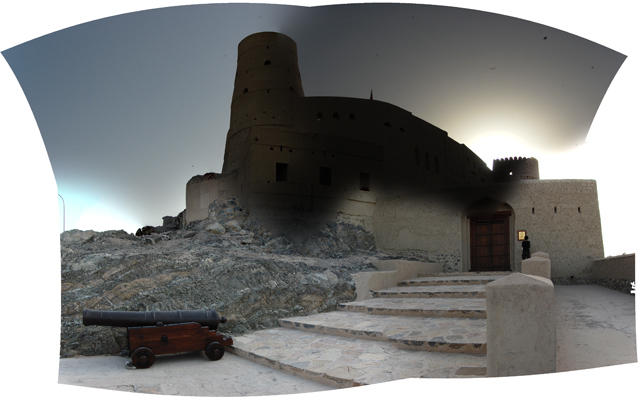 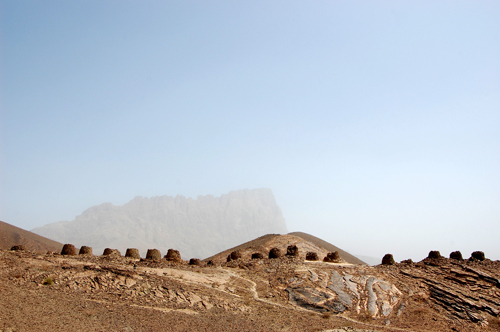 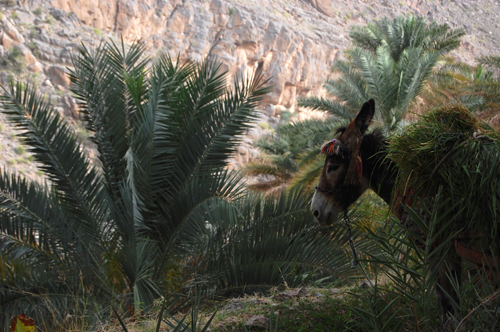 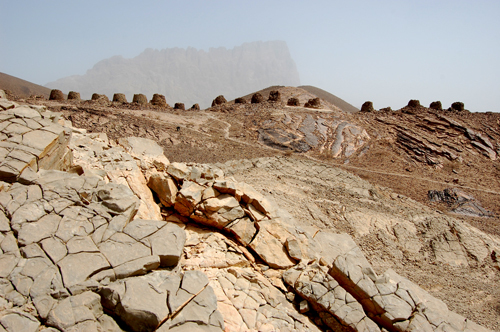 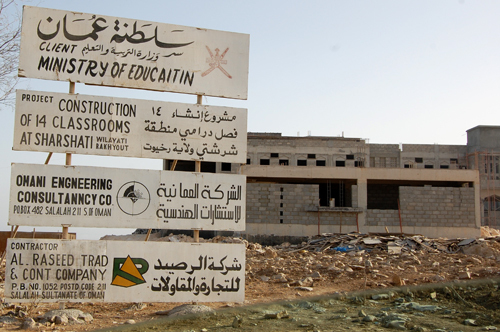 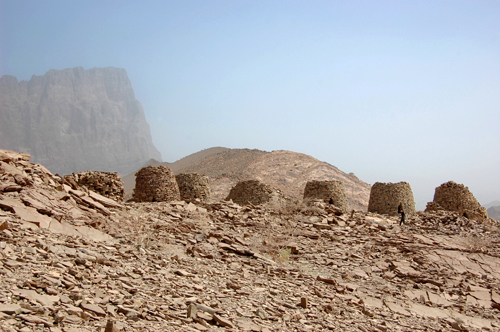 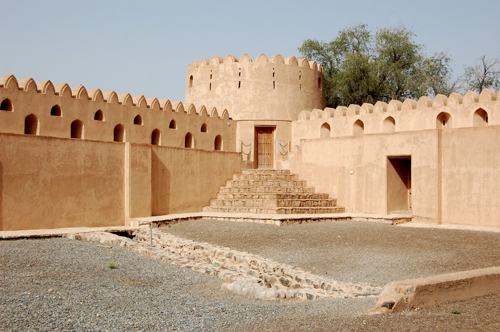 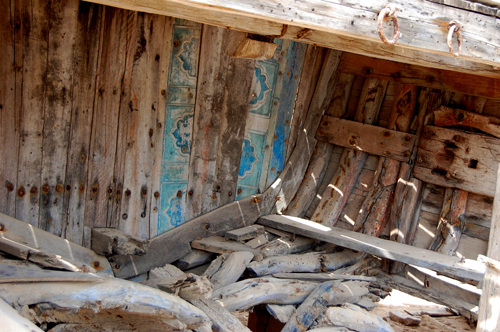 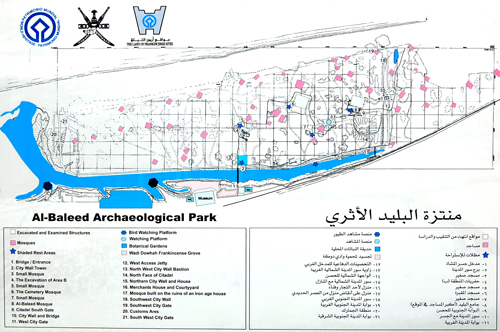 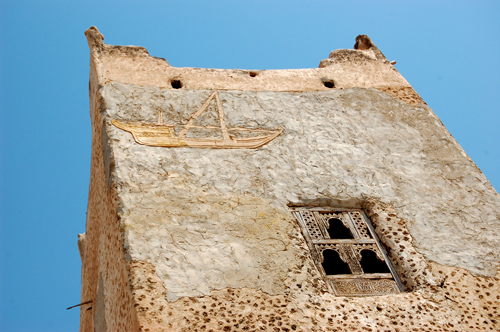 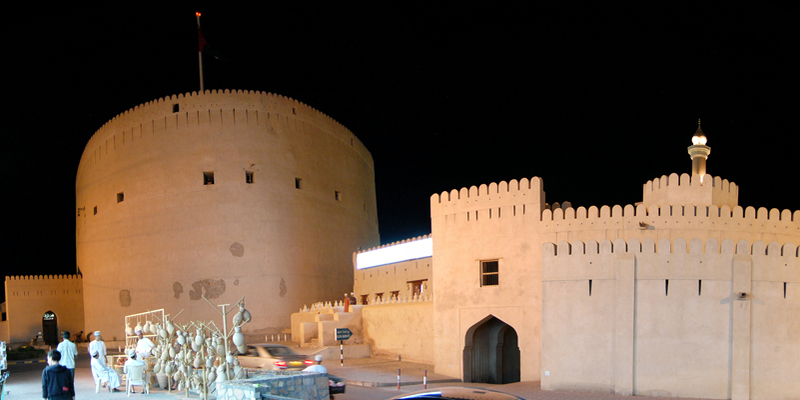 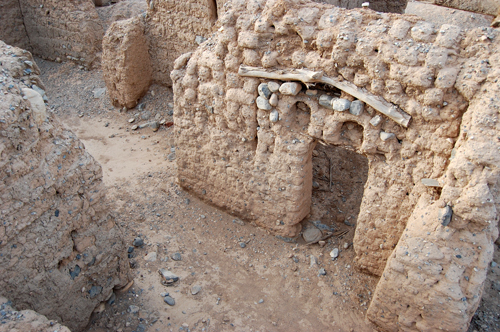 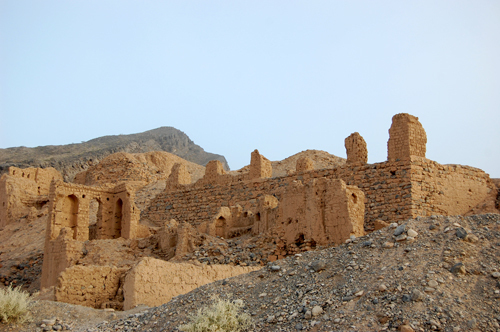 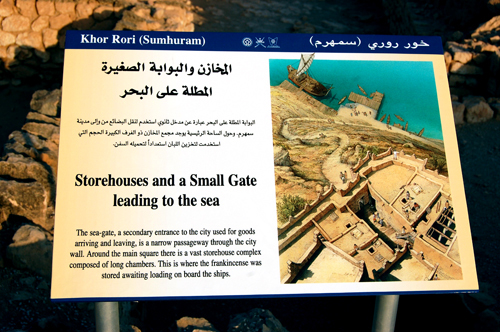 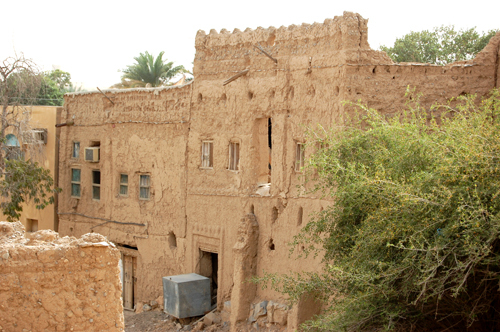 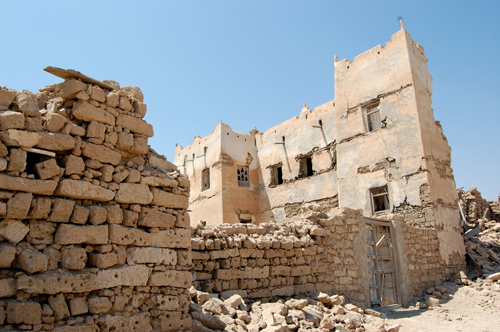 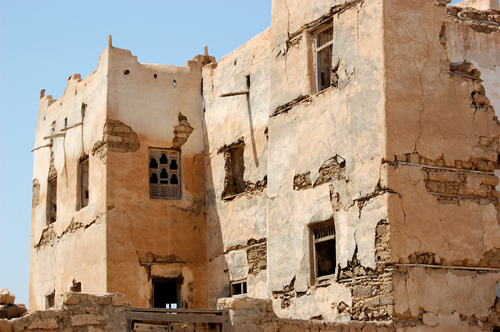 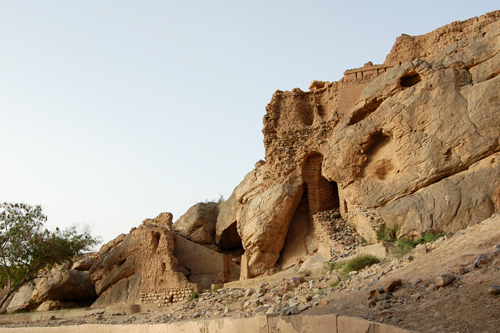 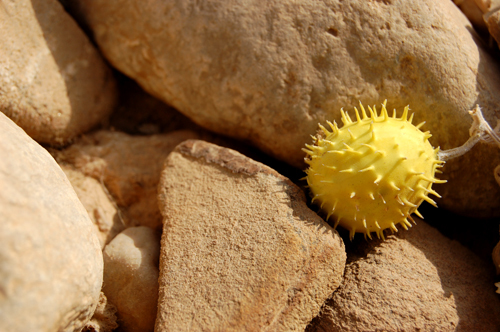 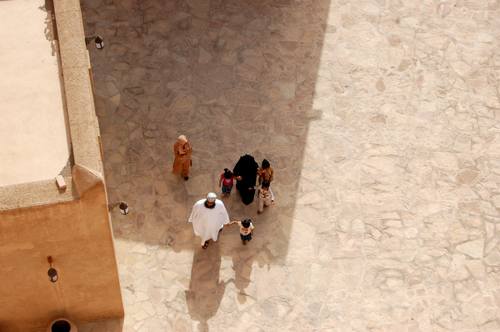 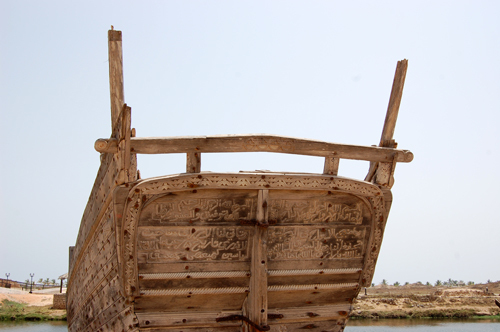 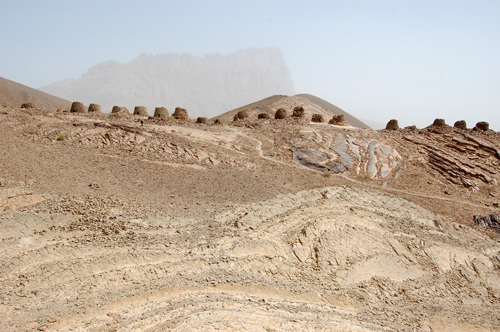 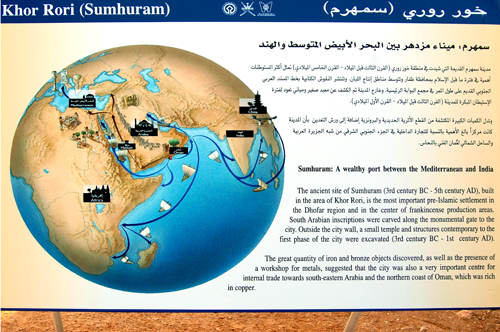 It was once the capital of Oman and the seat of knowledge and culture. 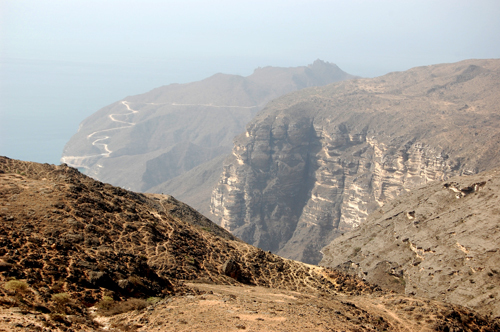 Here are some photos from the sites in the area including: Jebel Shams (which we drove to the top of in our Peugeot…maybe not the best idea), Tanuf, Bahla, Jabrin, Hamra, and Misfat al Abreyeen (the Venice of Oman…pictured above). 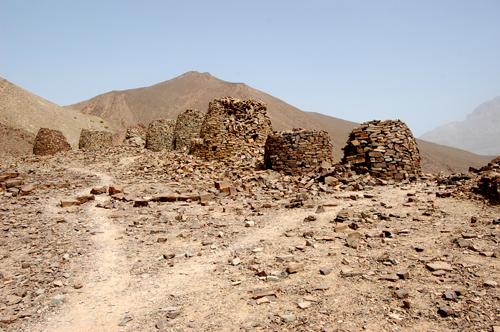 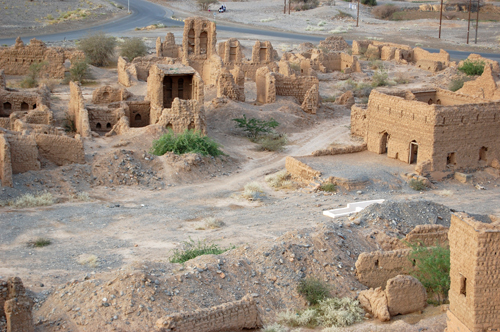 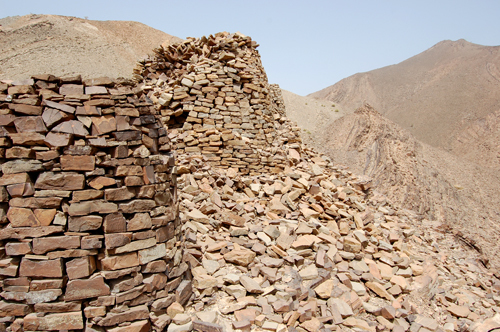 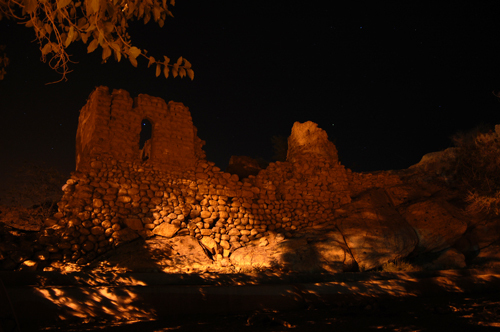 The ruins of old Tanuf is where we camped for two of our nights. 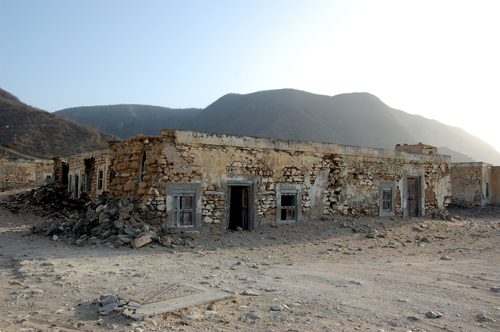 It was bombed by the British Royal Airforce in the mid 1950’s at the request of Sultan Qaboos’ father during the Jebel War. 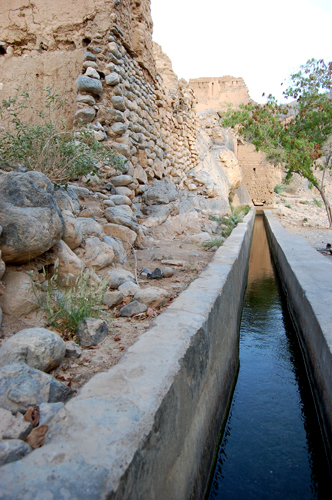 The Falaj is the irrigation system that still runs with flowing water though the ruins of the village. 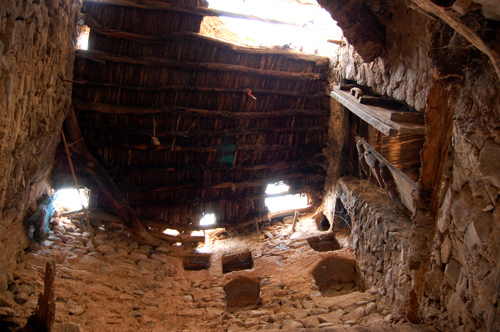 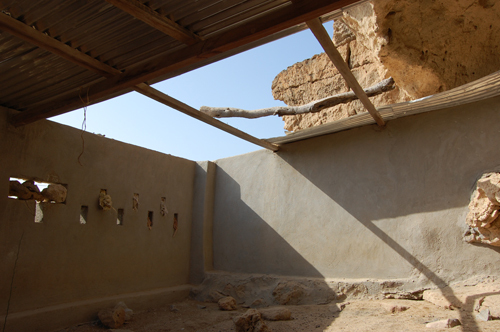 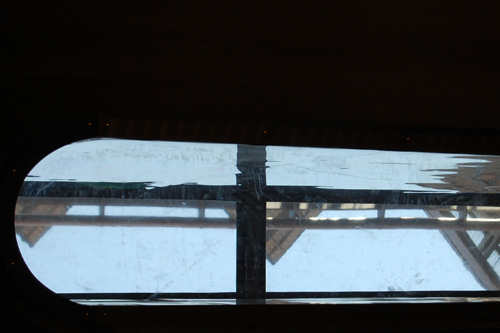 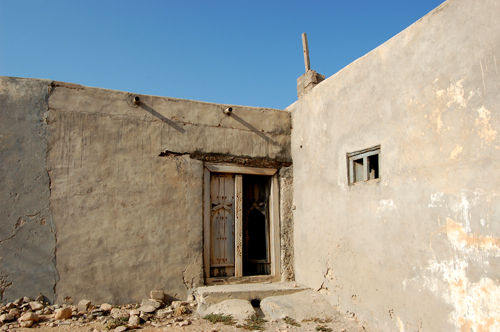 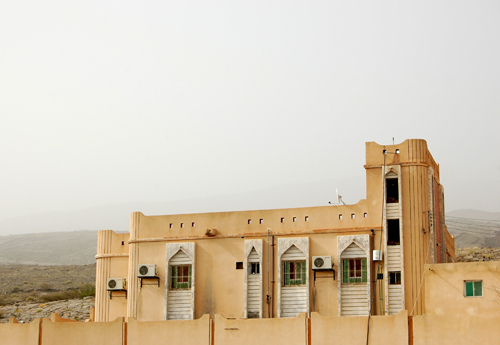 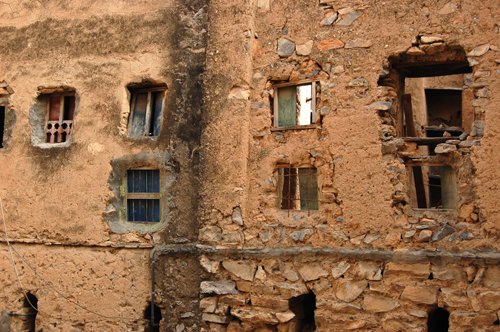 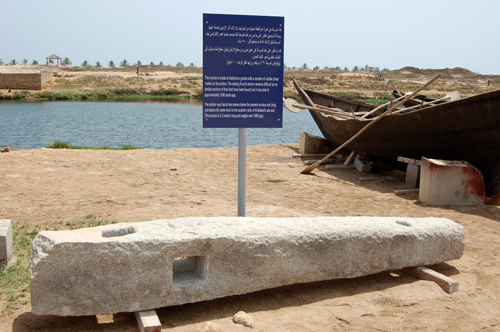 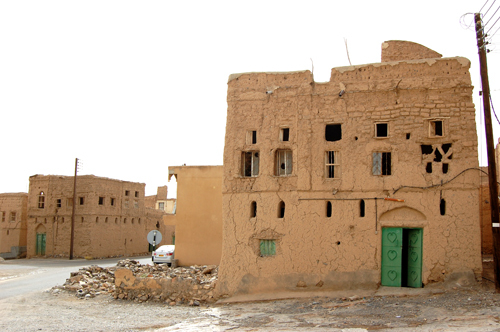 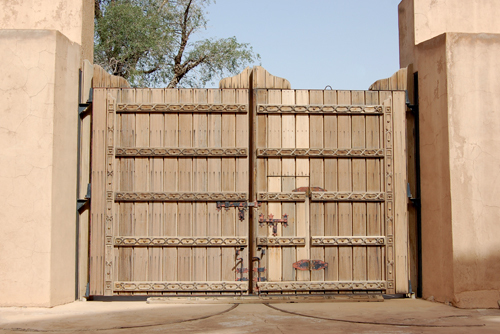 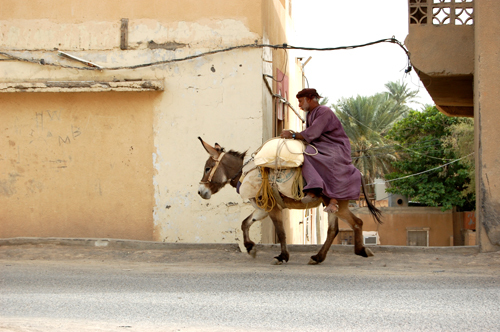 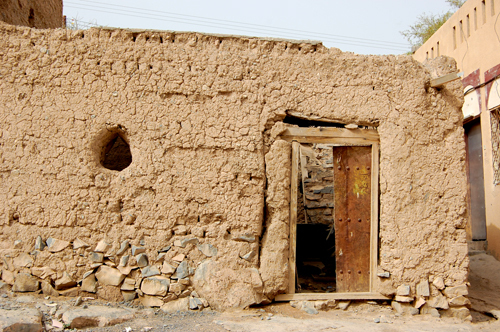 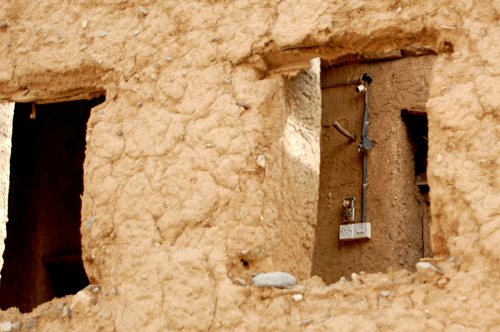 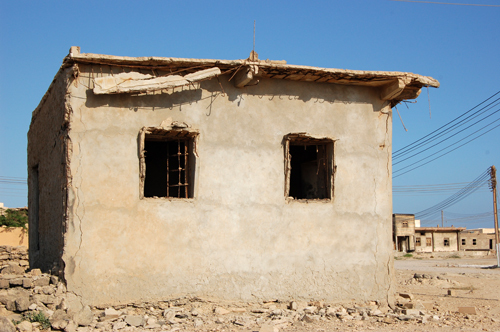 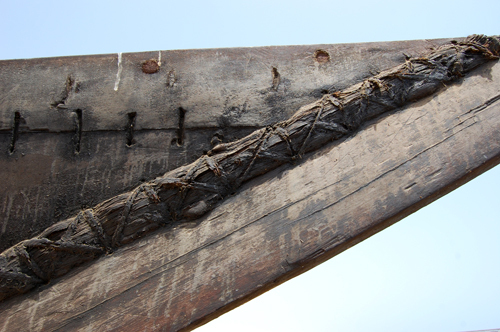 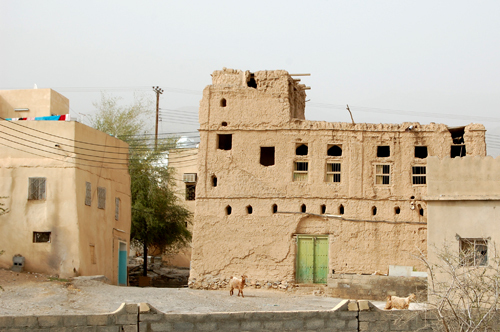 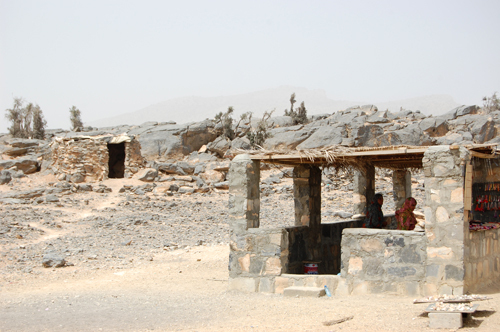 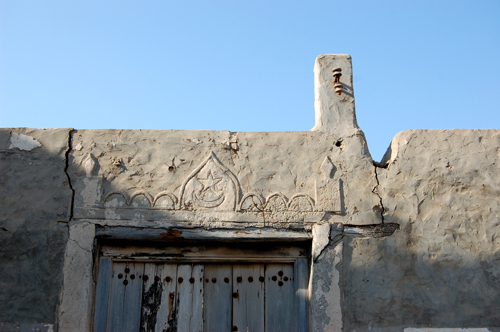 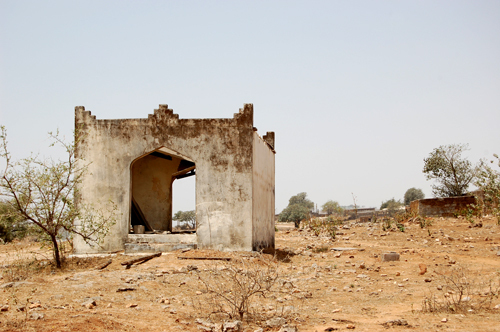 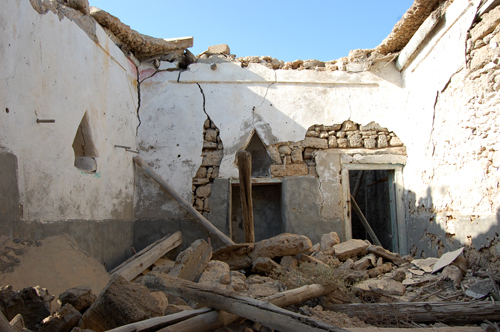 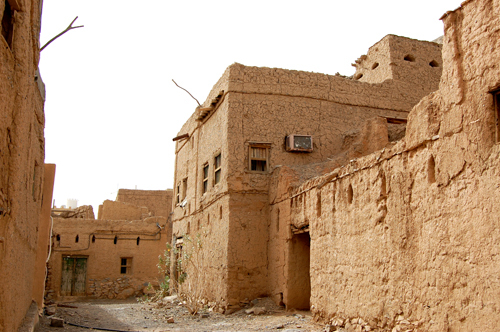 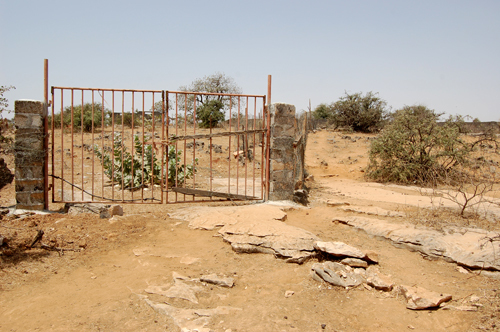 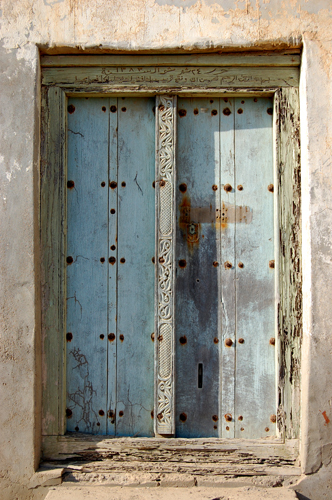 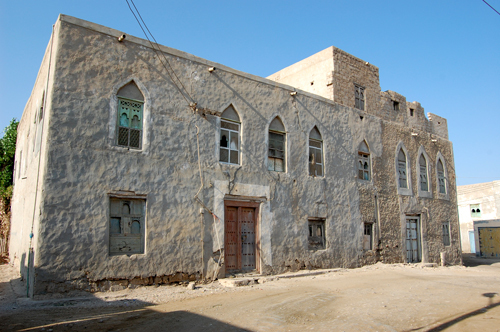 Every village in the region has a functioning Falaj that was engineered centuries ago. 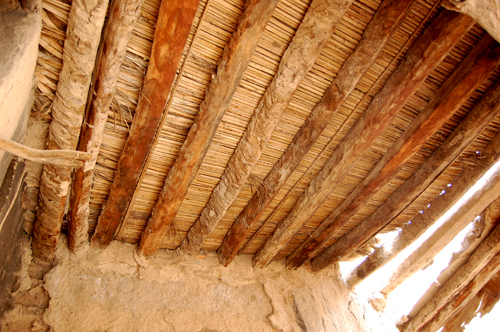 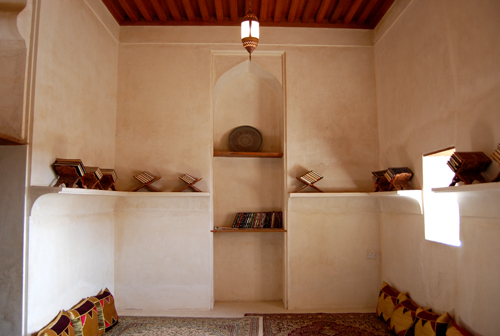 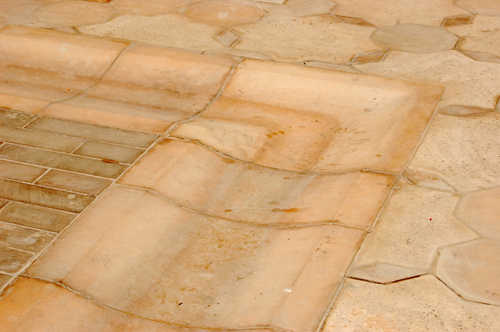 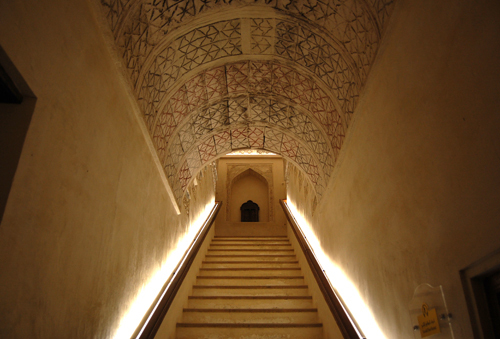 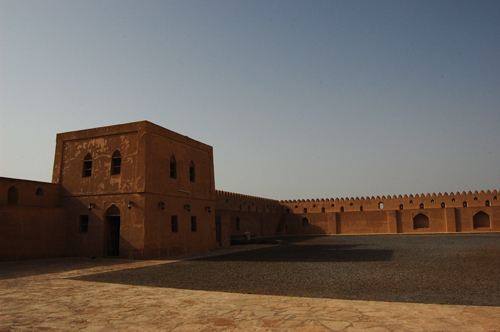 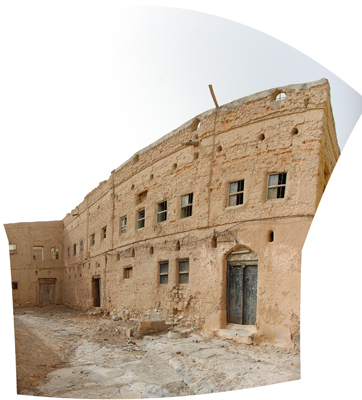 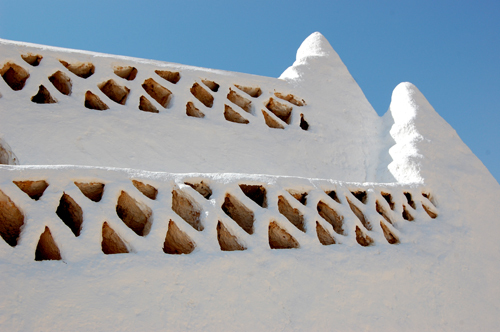 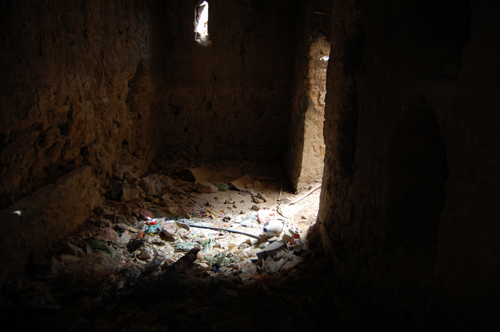 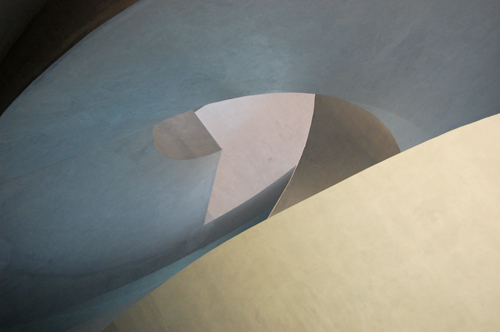 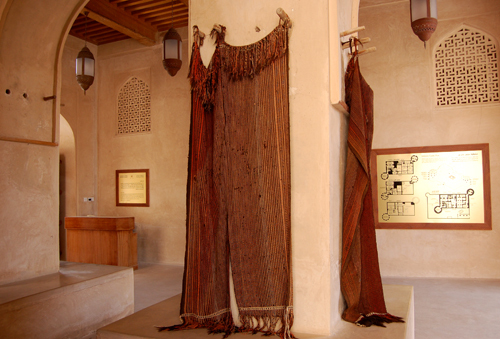 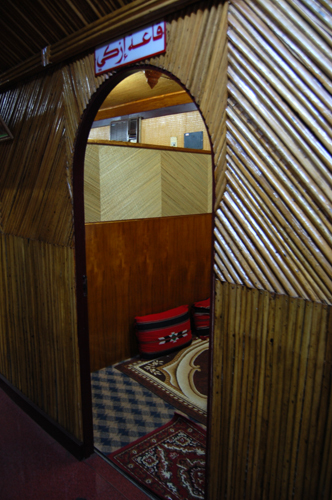 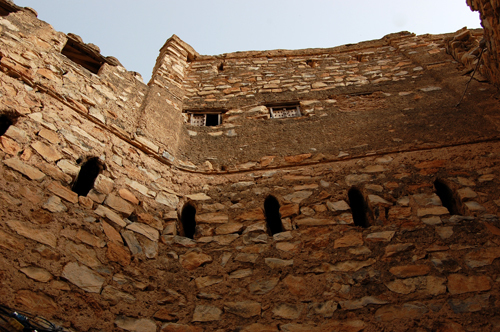 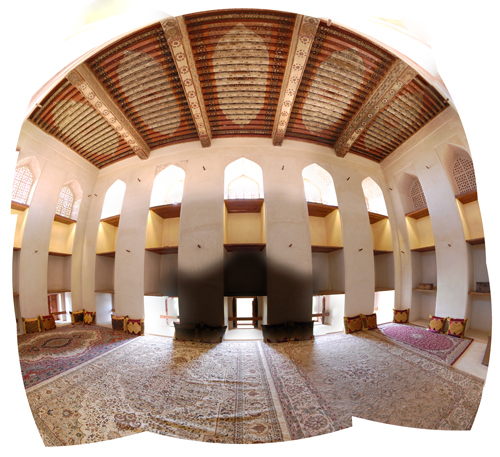 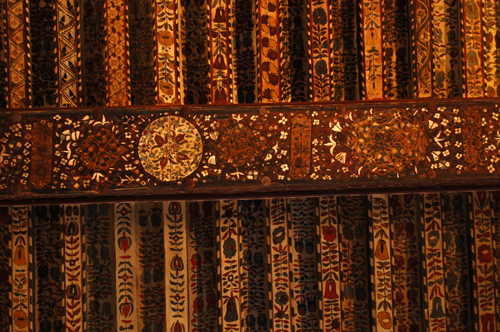 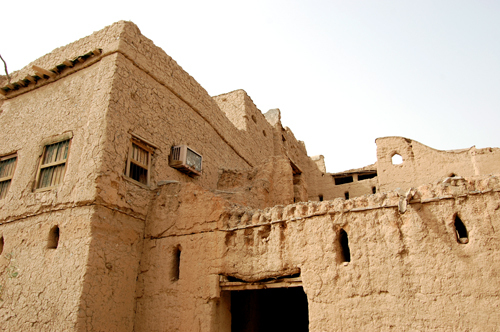 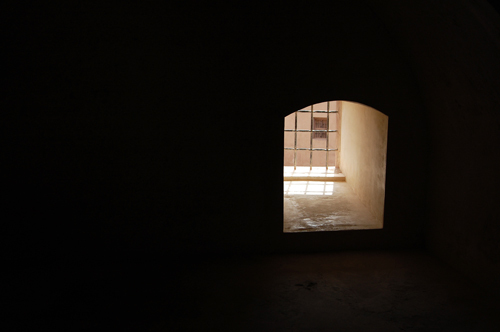 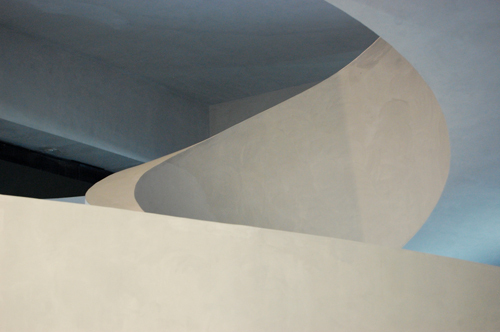 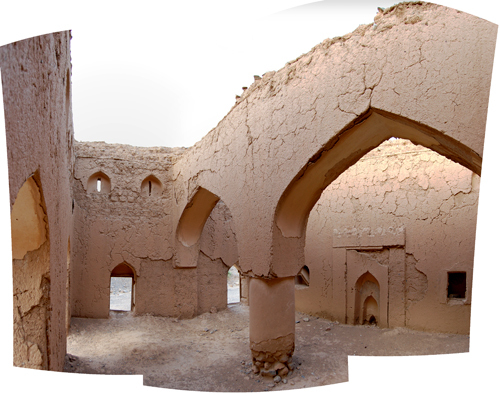 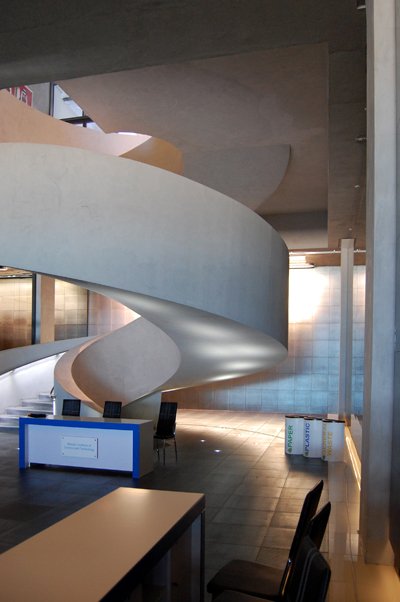 It is an integral part of Jebreen Castle as well, weaving its way through the rooms on the ground level. 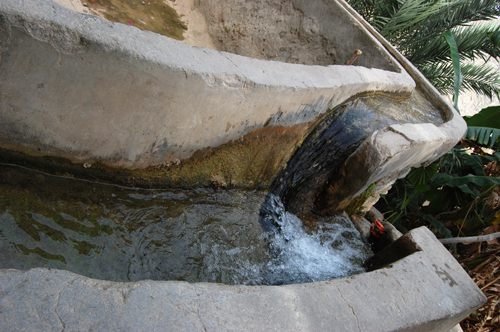 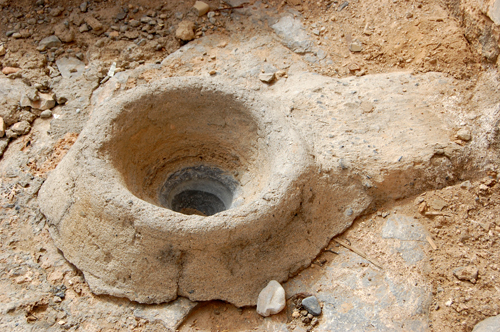 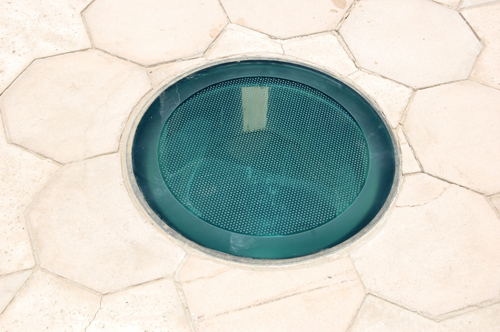 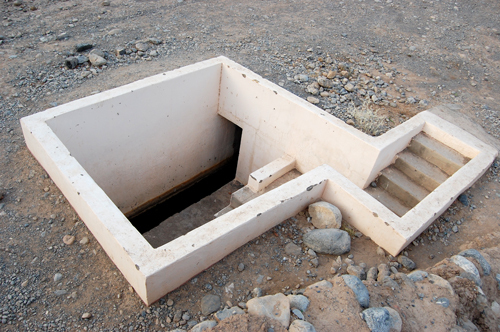 In Misfat al Abreyeen, the Falaj is very intricately engineered, allowing water to be turned on and off to each small agricultural plot all the way down the side of the mountain terrace. 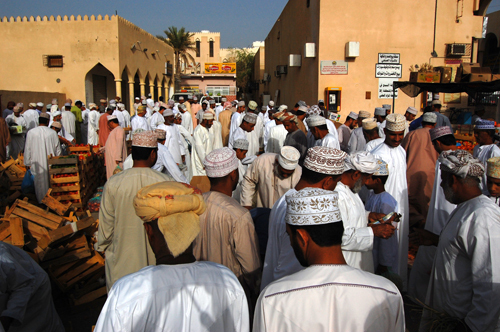 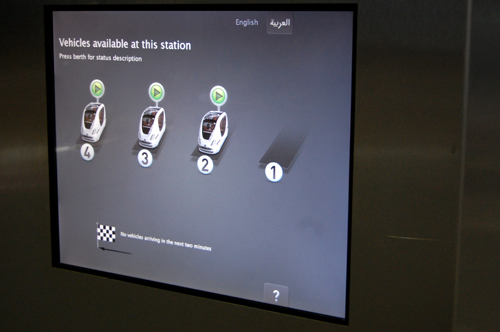 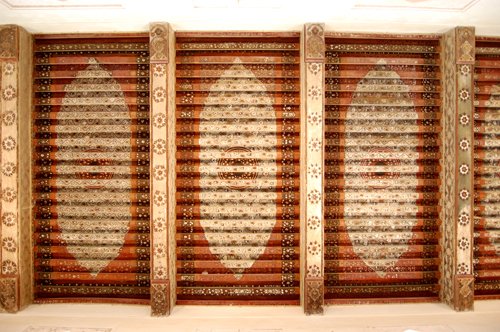 But before it leaves the city and flows to the gardens, one of its first uses is for the Wudhu area of the village mosque. 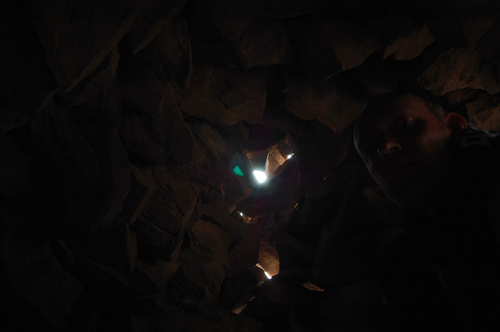 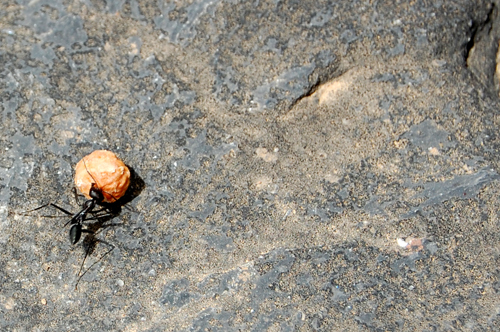 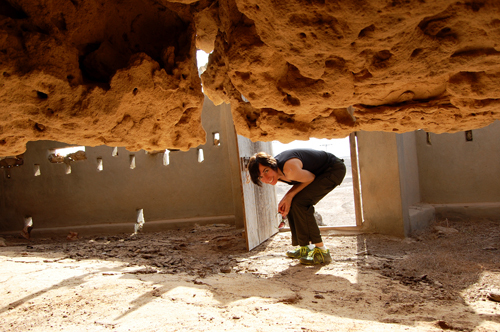 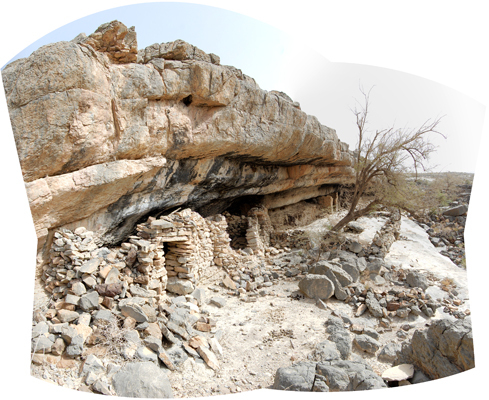 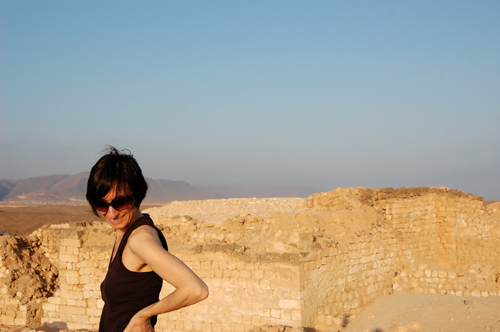 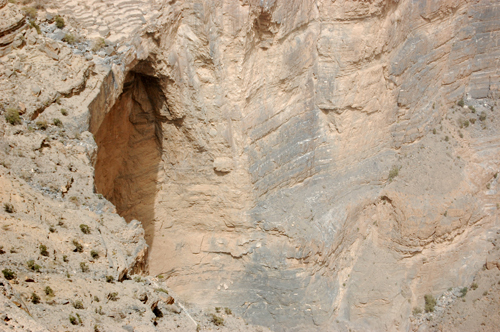 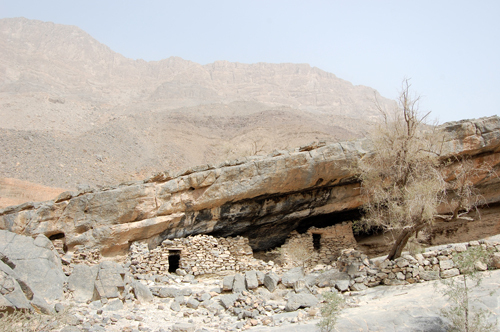 …some cave dwellings in a small wadi. 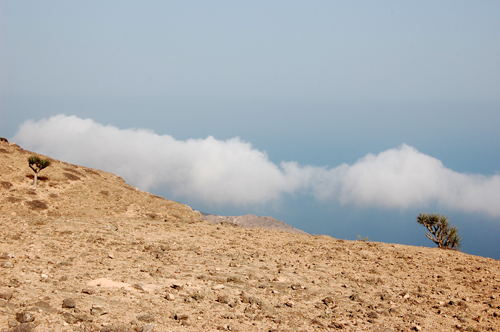 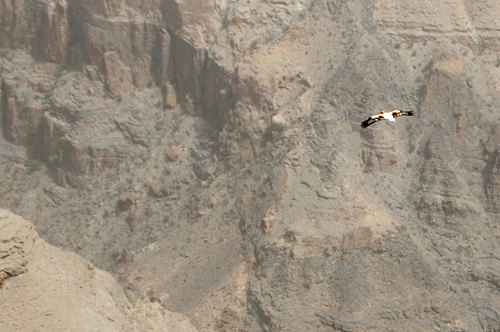 At the top of Oman. 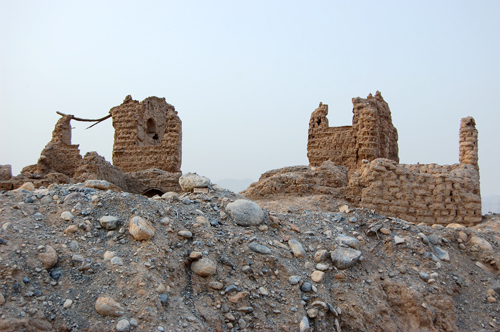 Jibreen Castle. 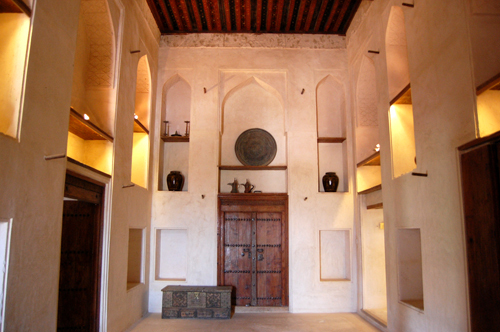 The intricately painted ceilings, the carved door surrounds, and the ornate rugs are framed within the otherwise austere architecture. 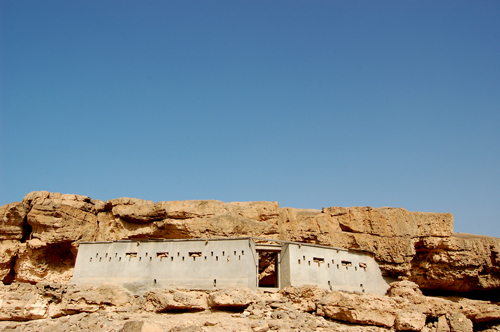 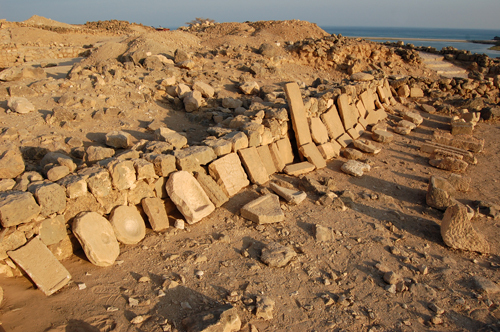 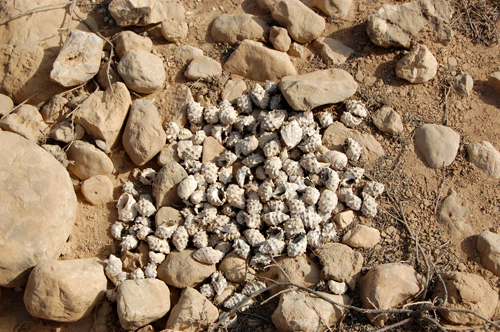 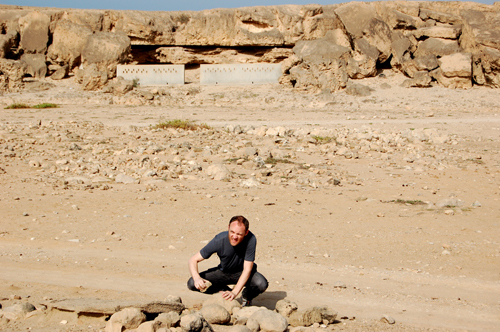 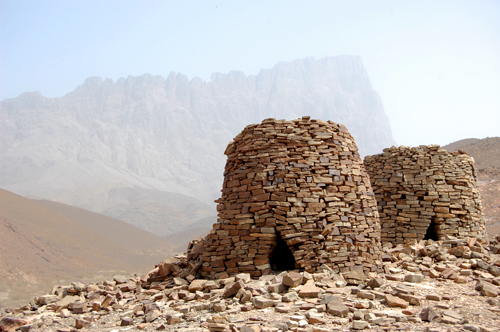 “beehive” tombs at Al-Ayn are 5000 years old. 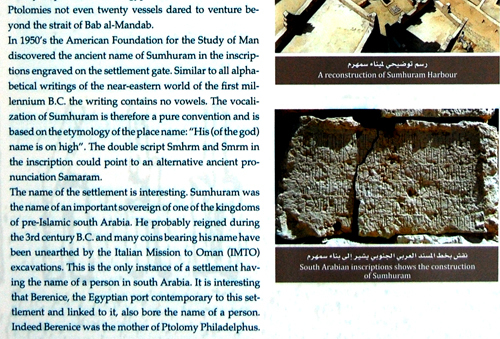 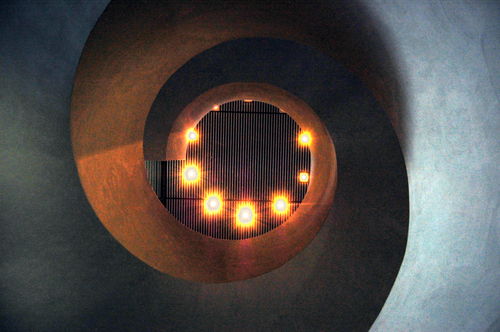 There is a great history in this PDF.